03.28.19 April’s Flavor Of The Month! Pop into any of our shops this April and enjoy the fan favorite flavor Chocolate Caramel Sea Salt! This flavor will be a staple in our cupcake case, every day! 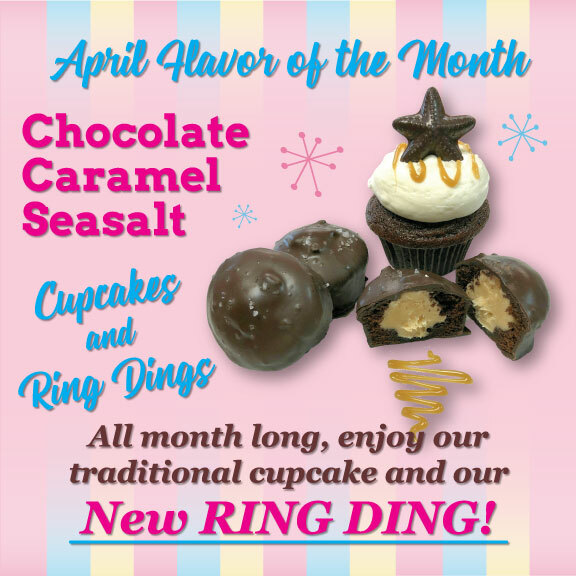 We will also have Chocolate Caramel Sea Salt ring dings all month long. 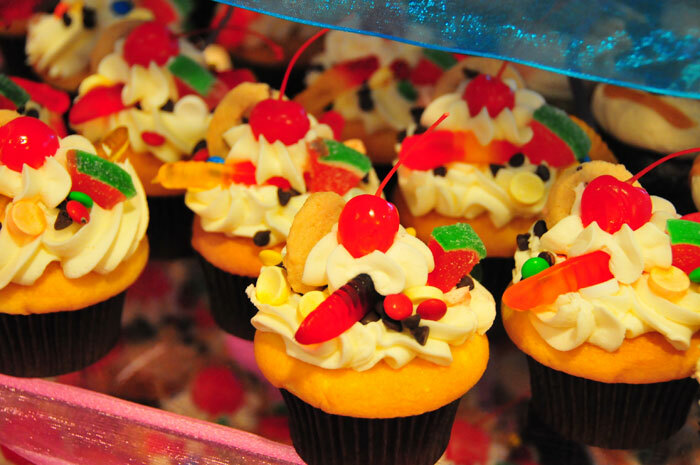 We hope to see you in the shop soon for a sweet treat! 02.12.19 A special Valentine’s Box of Cupcakes! Celebrate Valentine’s Day this Thursday, February 14th with an extra special box of chocolates. A CUPCAKE box of chocolates!! Nothing says "I love you" like a unique and delicious gift for your special someone or family! Only $24.99 for the box of 10. 11.02.18 Oh My, Homemade PIE!!! 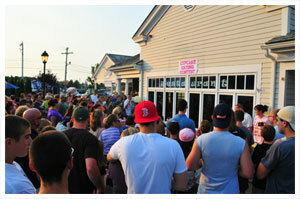 Big News at Cupcake Charlie’s! This year we are baking up fresh, homemade pies for THANKSGIVING. Relax this holiday season and let us take charge of your baking needs. Our 9-inch pies come in either an aluminum pie plate for $21.99 or a keepsake, re-usable glass pie plate for $24.99 - just like Grandma used to make! Call or come in to order before Saturday Novemebr 17th! 08.20.18 NEW PEACH CRISP coming on Wednesday the 22nd! 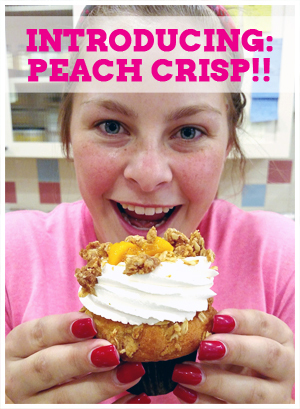 Join us this Wednesday to try our new flavor Peach Crisp! Indulge in the flavor of the summer peaches! August is National Peach Month, and August 22nd is National Eat a Peach Day! This cupcake is a delicious, moist, cinnamon and peach cupcake with a Peach Crisp topping baked in. It is topped with a light whipped topping, filled with a well of peach compote and sprinkled with baked peach crisp topping. 06.01.18 Shake of the Month: "Golden Graham’s S’mores!" 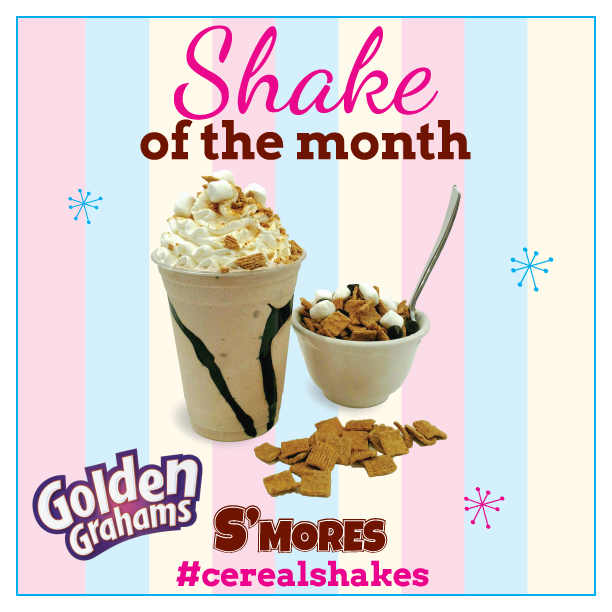 For the month of June we are offering "The Golden Graham’s S’mores" cereal shake! A twist of chocolate and vanilla ice cream with Golden Graham’s mixed in. Topped with whipped cream, more cereal, mini marshmallows and chocolate sauce! If you love cereal, you’re going to fall for our new line up of cereal shakes!! 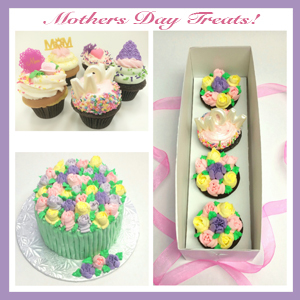 Treat your Mom to the best this year with some of our festive cupcakes, or delicious layer cakes. So many options to choose from! Available in store this Saturday & Sunday or call to place a special order. 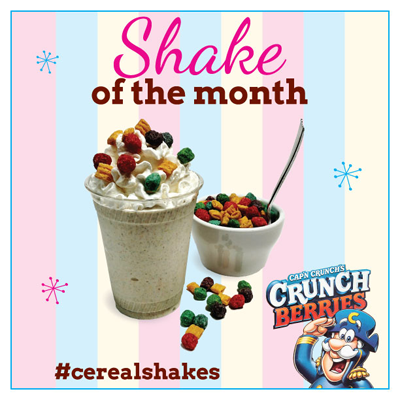 05.01.18 Shake of the Month: "Captain Crunch Berry"
For the month of May we are offering "The Captain Crunch Berry" cereal shake! A creamy combination of vanilla ice cream and crushed Captain Crunch Berry cereal mixed in, topped with whipped cream and more cereal on top! If you love cereal, you’re going to fall for our new line up of cereal shakes!! Keep an eye out for our next flavor combo, coming in June!! 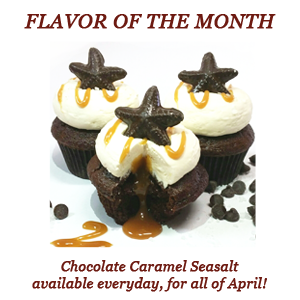 04.01.18 April’s Flavor of the Month: "Chocolate Caramel Seasalt"
For the month of April we are offering the fan favorite cupcake "Chocolate Caramel Seasalt"! This delicious combination of chocolate cake, caramel filling and caramel buttercream frosting is available at each of our stores, everyday, for the whole month! Don’t miss out on this, especially if this is one of your favorite cupcakes! 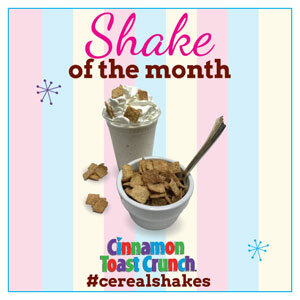 04.01.18 Shake of the Month: "Cinnamon Toast Crunch"
For the month of April we are offering "The Cinnamon Toast Crunch" cereal shake! A creamy combination of vanilla ice cream and crushed Cinnamon Toast Crunch cereal mixed in, topped with whipped cream and more cereal on top! If you love cereal, you’re going to fall for our new line up of cereal shakes!! Keep an eye out for our next flavor combos, coming in May and June - and be sure to try them all!! 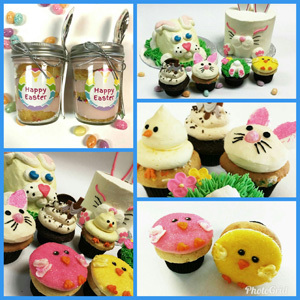 03.23.18 Easter Cupcakes & Cakes now available! 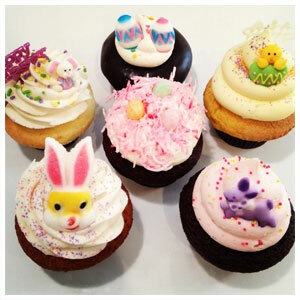 Special Easter cupcakes are available at all open shops leading up to Saturday March 31st. Stop by or order ahead. Festive bunny layer cakes can be made in your flavor of choice. $26.99 - $36.99. Also - don't forget our delicious 4-layer carrot cakes, perfect for your dessert tables! 03.01.18 Shake of the Month: "The Lucky Charm"
March 1st starts the first of a 4-flavor series of our delicious new Cereal Shakes!! 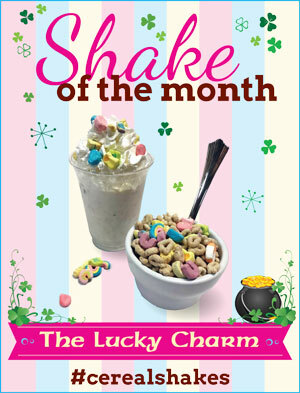 In honor of St. Patrick’s Day, this month we will be offering "The Lucky Charm". A creamy combination of vanilla ice cream and Lucky Charms cereal, all topped with whipped cream and Lucky Charms marshmallows. If you love cereal, you’re going to fall for our new line up of cereal shakes!! Keep an eye out for our next flavor combos, coming in April, May and June - and be sure to try them all!! This holiday season we are spicing things up with a great variety of Sweet Treats! Spend more quality time with friends and family - Eating dessert instead of making it! Choose from a variety of our crowd-pleasing options! 2016 Chanukah Cupcakes - You choose your favorite flavors and we will dress them for Chanukah! **2-layer Dessert Cakes (6" or 8" Round) - $29.99 - $39.99** You can now get any of our delicious Daily Flavors in a 2-layer Round Cake!! Or go for one of our Festive Holiday designs! Help us Spread the tasty Love!! Cake Pops Galore - $2.50 - $4.50 depending on the design. Make a splash on your dessert table with a handful of these fun and delicious cake pop treats! 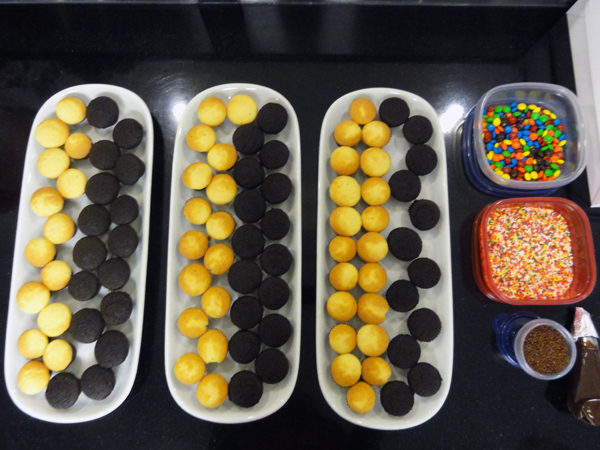 Cupcakes, Cakes and Cookie Dips . 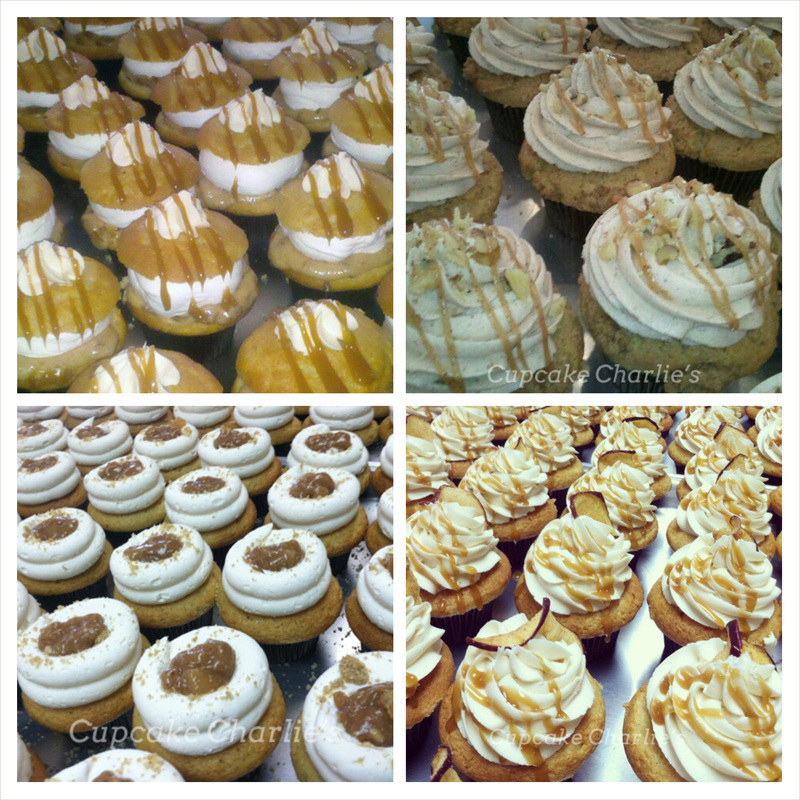 . . Be the Dessert Hero this year at your Family Thanksgiving, with delicious treats from Cupcake Charlie's. 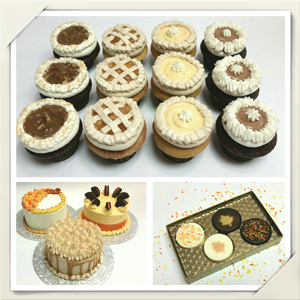 We are excited to be offering our Exclusive "Cupcake Pie Assortment" Indulge in one of 4 flavors - Chocolate Pecan Pie, Apple Pie, Pumpkin Pie and Chocolate Cream Pie!! This Assortment is available by Special Order Only - so don't miss out - Be sure to Call Today and place your order!! We are also offering our 6" and 8" Layer Cakes. You can choose any one of your favorite cupcake flavors, and we will make it into a beautiful cake - perfect for your dessert centerpiece!! And don't forget about our many other Sweet treats . 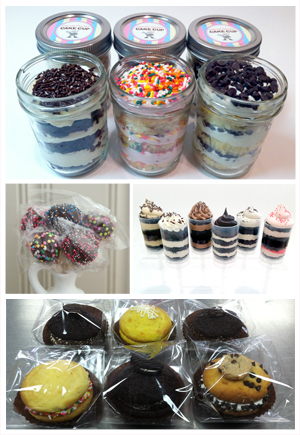 . . Cookie Dips, Whoopie Pies, Cookies, Cookie Sandwiches, Cupcake Jars and more! NOTE: Most of our products can also be made GLUTEN FREE! Call today for more details. We are so excited about our New Fall treat!! 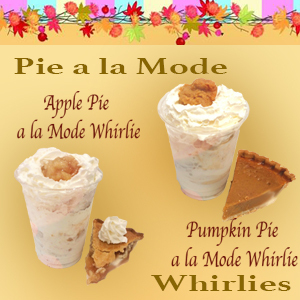 Available starting Sat., October 1st, we will be offering our Pie a la Mode Whirlies!! A real piece of Pumpkin or Apple pie, blended with our premium, soft serve ice cream! This is a delicious experience that you don't want to miss out on!! Happy Fall!! This Summer, we tasked our managers to get creative and come up with a new Apple Flavor for the month of September - The winner is . . . Apple Cider Donut!! It is a moist and delicious Apple Cider Cake, dipped in an Apple Butter Glaze, topped with a ring of Apple Cider Buttercream, which is dipped in a white and brown sugar crunch, and all drizzled in an amazing Cream Cheese Donut Glaze!! What?!?!?! Yes, it is a MUST TRY!! 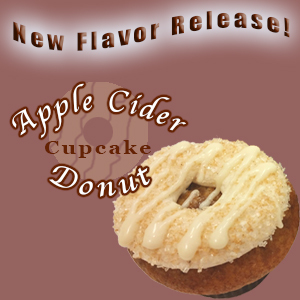 This new Flavor will be released on Saturday, September 17th, and will be available that day in all 7 shops! Be sure to mark your calendars and prepare to have your taste buds dazzled!! 4.25.16 Mother's Day Cakes and Cupcakes! Mother's Day is on Sunday, May 8th! 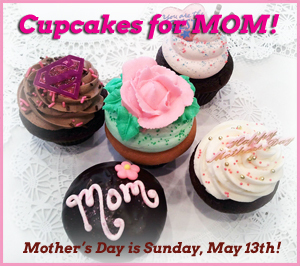 What better way to pamper your Mom this year, than adding cupcakes to the mix!! 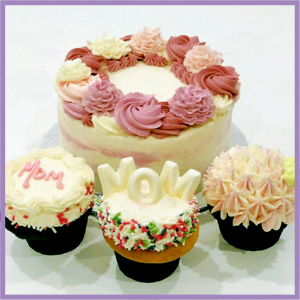 Surprise your Mom with our special Floral 4-layer cake or with some of our festive cupcakes!! Be sure to call your local shop today to place your order - Make Mom a priority this year - I know we are!! Decorations may vary from shop to shop, but we will have a festive case of special cupcakes on Saturday the 7th and Sunday the 8th. We will be OPEN regular business hours on Mother's Day, for all your last minute treat needs! 4.25.16 NEW Product - Cookie Dips!! We are so excited to announce a new product - Our delicious Cookie Dips!! If you like cookies and you like chocolate, then you are going to fall in love with this new product!! We take a chocolate sandwich cookie, and we add a fun and tasty surprise inside the cookie. We then cover the whole cookie in creamy, decadent chocolate and top it off with a matching flavor crumble of goodness - and then drizzle the whole thing in more chocolate. Our current flavors are Chocolate Peanut Butter, Chocolate Mint, and Chocolate Caramel Seasalt. We look forward to your next visit so we can introduce you to our new Cookie Dips!! We are also offering our delicious Layer Cakes!! We can make any of favorite cupcake flavors into a yummy round layer cake!! 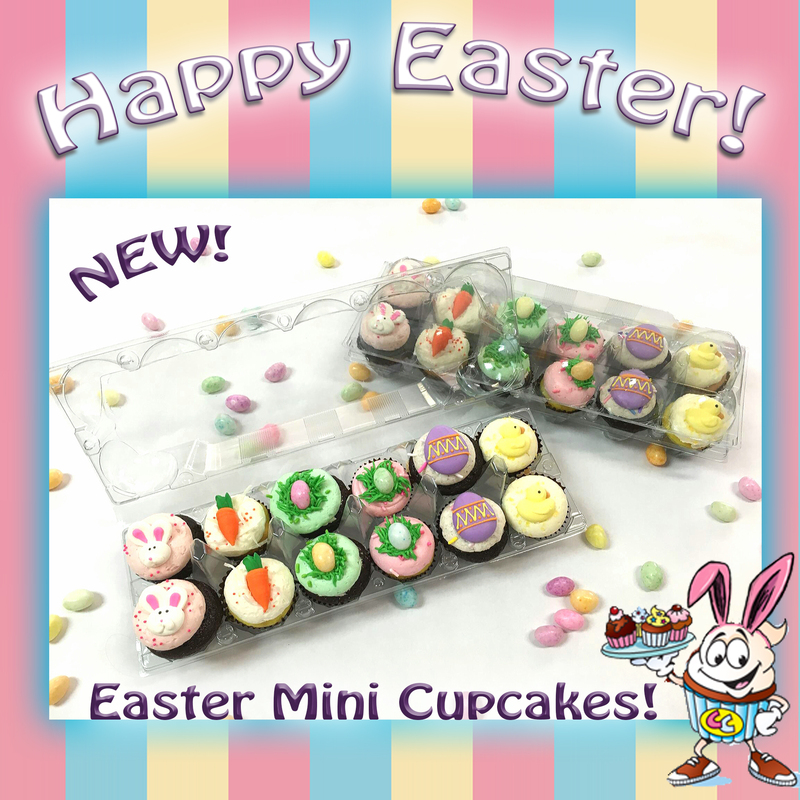 Prices range from $26.99 - $29.99 Let us do all your baking this Easter Season! Enjoy celebrating St. Patricks Day with some of our fun and unique cupcake designs. 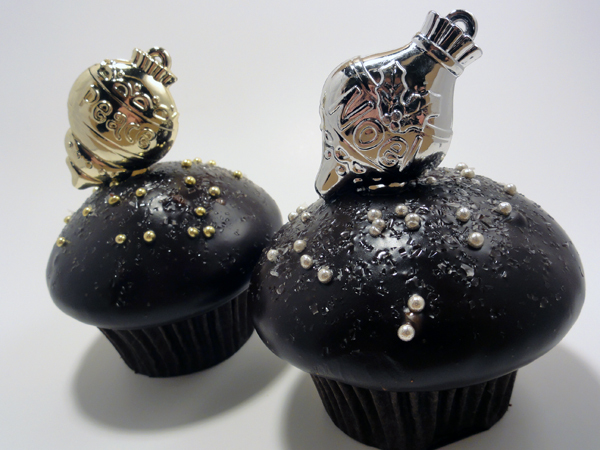 Themed Cupcakes will be available at all 7 shops locations! This holiday season, we aren't just making cupcakes, we are making some great cakes too! Spend more holiday time with friends and family eating dessert instead of baking it! Choose from a variety of crowd-pleasing options! December is a time to indulge is all things sweet. 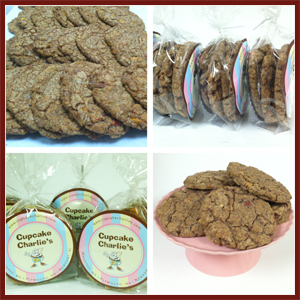 Here at Cupcake Charlie's we bring back all of our decadent Gingerbread flavors! Enjoy traditional favorites such as our Gingerbread Cheesecake, Gingerbread Hot Chocolate, Chocolate Gingersnap or our rich and delicious Gingerbread Pecan Pie !! Each of the 7 shop locations will be baking up a different Gingerbread flavor each day. Be sure to stop by and catch them while you can, because once December is over - our Gingerbread recipes go back in their hiding place until next year! Cupcakes, Cakes and Pies - Oh My! Spice up your Holiday dessert table with some of our tasty, homemade treats! We will be offering a wide selection of our gourmet cupcakes, along with our 4-layer Carrot Cake and our *NEW Pumpkin Caramel Cake!! Can't decide between cake and pie . . . have them both with our unique and delicious Pumpkin Pie Cupcake and Apple Pie Cupcake! All 7 shops are accepting orders, Now through November 25th. Give us a call today - we would love to hear from you!! 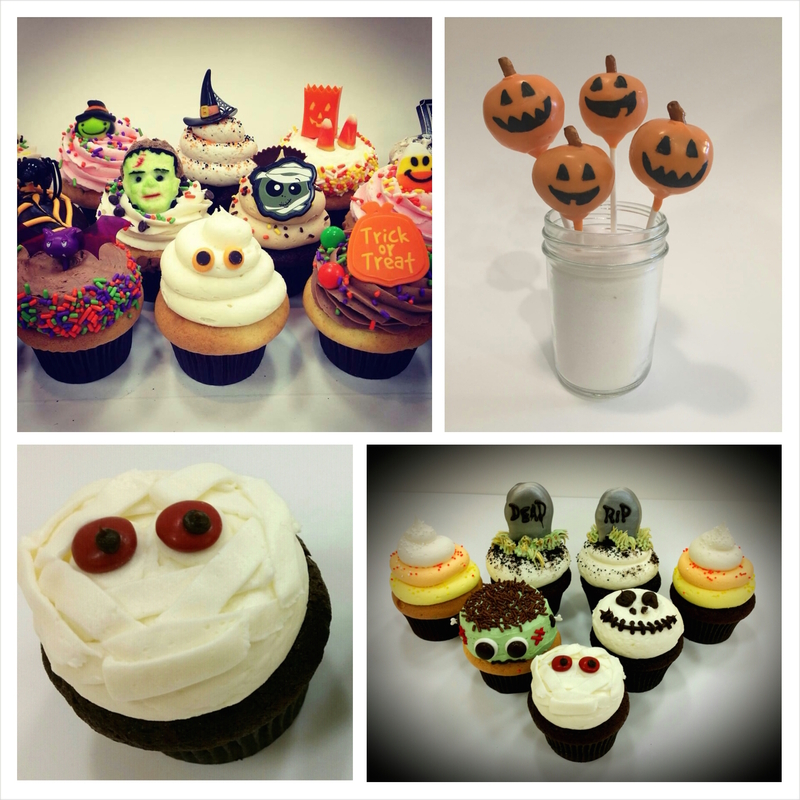 10.20.15 Halloween Cupcakes & Treats! Available now through October 31st! Halloween is one of our favorite holidays here at Cupcake Charlie's. We have so much fun getting creative with our cupcakes! Come on into any of our 7 shop locations, and choose from a spooktacular assortment of delicious and decorated cupcakes - now through Halloween! Order an assortment of your favorite flavors for your upcoming Halloween party too! Trick or Treat at Cupcake Charlie's! Mashpee Shop - Saturday October 24th at 3:00pm (After Halloween Parade) Also on Halloween! Foxboro Shop - Tuesday October 27th at 12:30pm and 5:30pm. Also on Halloween! Plymouth Shop - All Day on Halloween! Newport Shop - All Day on Halloween! The wait is over - we are so excited to announce that Pumpkin Season is finally here again!! The Fall is such a festive time of year, and we like to "Spice it Up" by dusting off our Pumpkin Recipe Book. Every day in October and November, each of our 7 shop locations will be baking up one of our delicious pumpkin cupcakes. Each one is worth a try!! Enjoy flavors such as our classic Pumpkin Spice, Pumpkin Pie, Pumpkin Caramel Cheesecake, Pumpkin Chocolate Chip, Pumpkin Patch, Pumpkin Walnut Streusel, Chocolate Pumpkin Pie and Pumpkin Pecan Crunch! We dare you to indulge!! September brings with it, some exciting new flavors. We begin to celebrate Fall with our Flavor of the Month. September is all things Apple! Enjoy flavors like Apples Foster, Caramel Apple, Apple Crisp and Apple Pie! The morning baker at each shop will decide what delicious flavor they will bake up each morning. 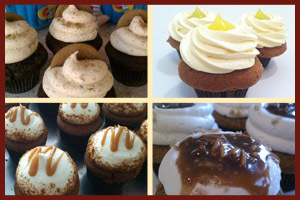 Be sure to visit us on Facebook.com/cupcakecharlies for a daily list of what each shop is offering. They are all so yummy you will want to get in to try each one! 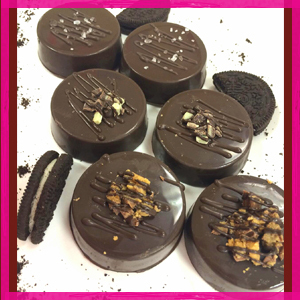 Celebrate your love for chocolate this Valentine's Day with any of our many sweet treats!! Our Cupcakes, cake pops, cookies and cupcake cakes are all decorated specially! The cupcake case will be stocked on Valentine's Day and you can call ahead to order whatever your heart desires! Give something extra special this Valentine's Day. Our Cupcake Box of Chocolates is a pre-assorted dozen complete with four of our most popular gourmet cupcakes, topped with matching chocolates! Call or come in to pre-order your assortment. All pre-orders will be packaged in a red cupcake box and dressed with a big ribbon! 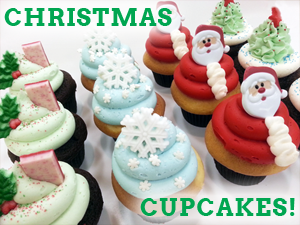 12.04.14 Cakes and Cupcakes for Christmas! This holiday season, we aren't just making cupcakes, we are making some great cakes too! Spend more holiday time with friends and family instead of baking! Choose from any of these crowd-pleasing dessert options! Feeds 8-12 people. Choose from chocolate or vanilla cake layers! 12.04.14 Our Opening at the Natick Mall! Our doors are OPENING on Monday, December 15th! 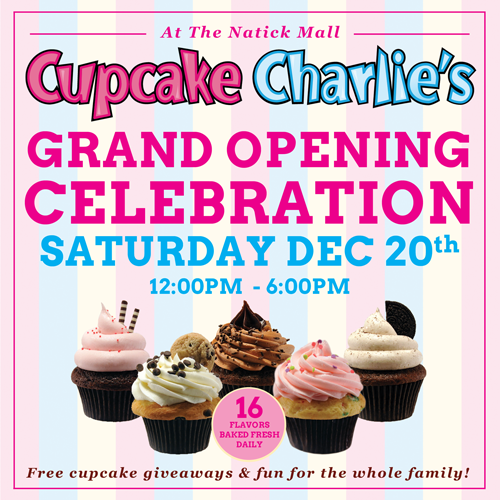 All of us at Cupcake Charlie's are excited to bring you our new franchise location at The Natick Mall! We will be open from 10am to 9pm bringing you "New England's Best Cupcakes" along with other fan favorite sweet treats you may be familiar with: cookies, trifles, cake cups, frosting shots and more!! Be sure to stop in during your holiday shopping! Join us for free cupcake giveaways and fun for the whole family! 12.01.14 FLAVOR OF THE MONTH = GINGERBREAD! 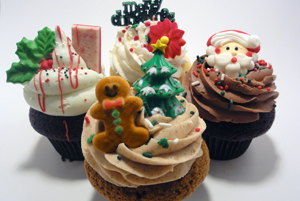 Throughout the month of December, we are baking up our special, seasonal Gingerbread Cupcakes! Enjoy the holiday season with any of our 8 different gingerbread flavors. Every day at each of our locations we bake one of our different flavors! Enjoy flavors: Jolly Gingerbread, Gingerbread Hot Chocolate, Gingerbread Pecan Pie, Gingerbread Lemon Whip, Gingerbread Caramel Latte, Gingerbread Cheesecake, Gingerbread Hazelnut Pancake, and Chocolate Gingerbread Snap! 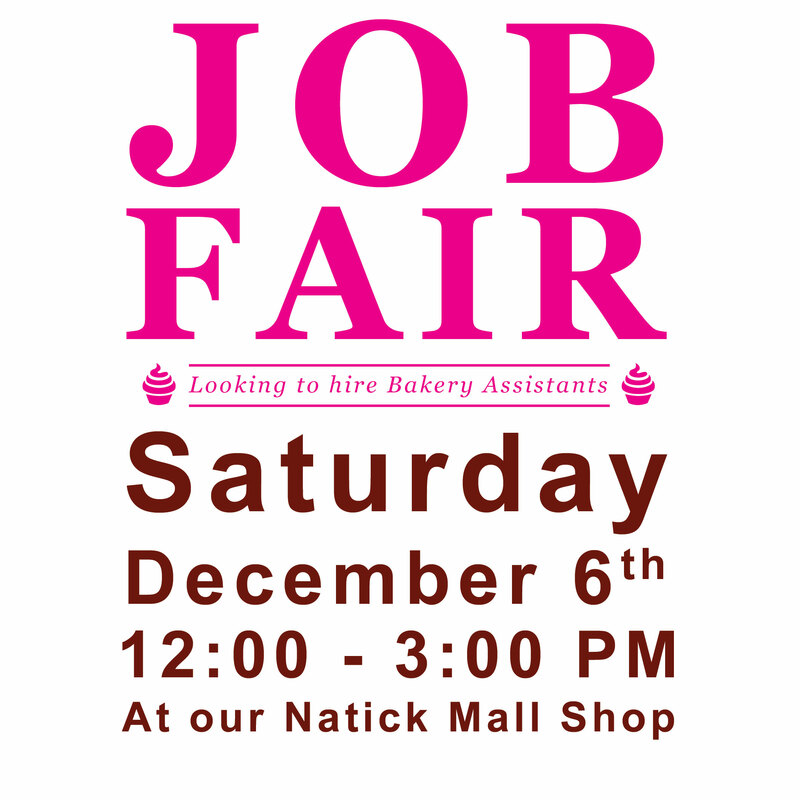 11.20.14 Attend our JOB FAIR at the Natick Mall! Hiring Bakery Assistants! 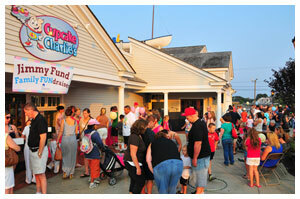 Have you always wanted to work for Cupcake Charlie's or work in a fun, fast-paced environment?! Do you have a flexible work schedule including days, nights and weekends? Come to our JOB FAIR for a chance to show your skills and apply for a position at our new location coming to the Natick Mall this December! Applicants must be 16 years or older. 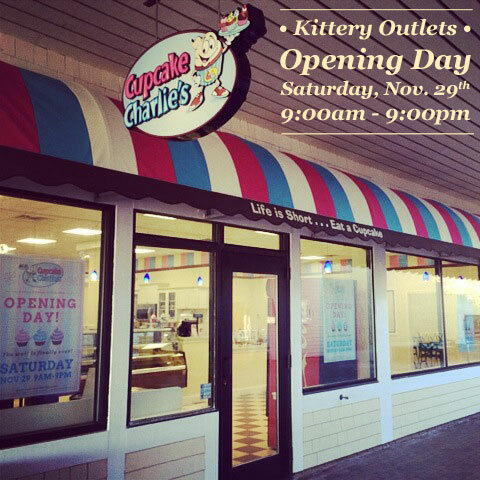 11.20.14 Our Opening Day at the Kittery Outlets! We are OPENING on SATURDAY, NOVEMBER 29th! Our newest shop and first franchise is excited and proud to announce an opening date of Saturday, November 29th! We will be open from 9am to 9pm bringing you "New England's Best Cupcakes" along with our new freshly baked muffins and some fan favorites you may be familiar with: cookies, trifles, cake cups, frosting shots and more!! Be sure to stop in and warm up during your holiday shopping at the Outlets! Located in the Plaza with Nike and Children's Place! 11.18.14 Opening EARLY on BLACK FRIDAY in FOXBORO! 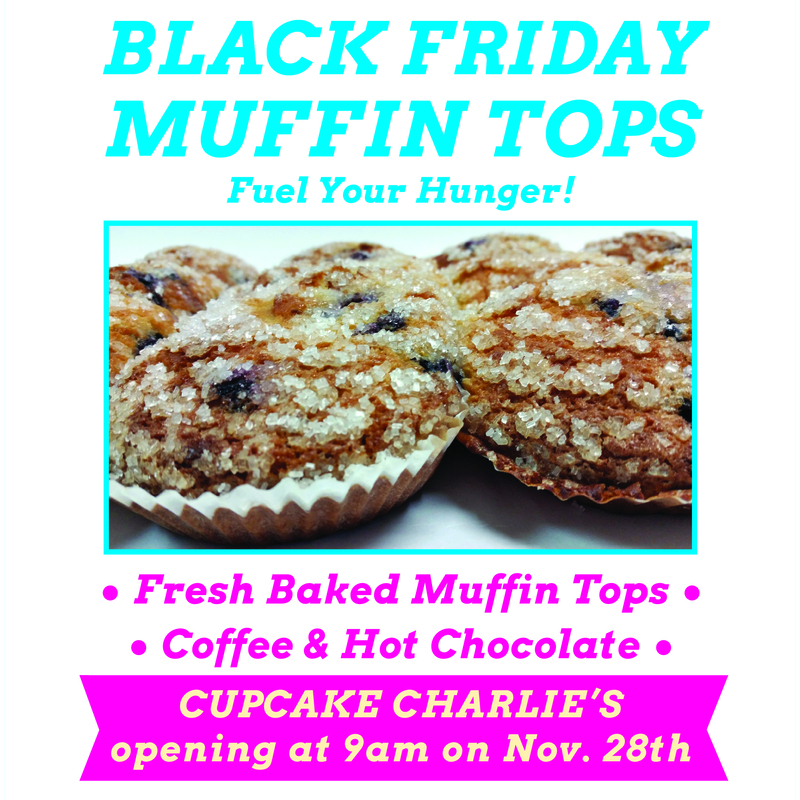 Shop at Patriot Place this Black Friday and fuel up with our MUFFIN TOPS! For the first time ever, we are baking delicious, warm, muffin tops! We will be opening extra early at 9am to bring you hot coffee and muffin tops to help your shopping stamina! 11.18.14 Cakes and Cupcakes for Thanksgiving! 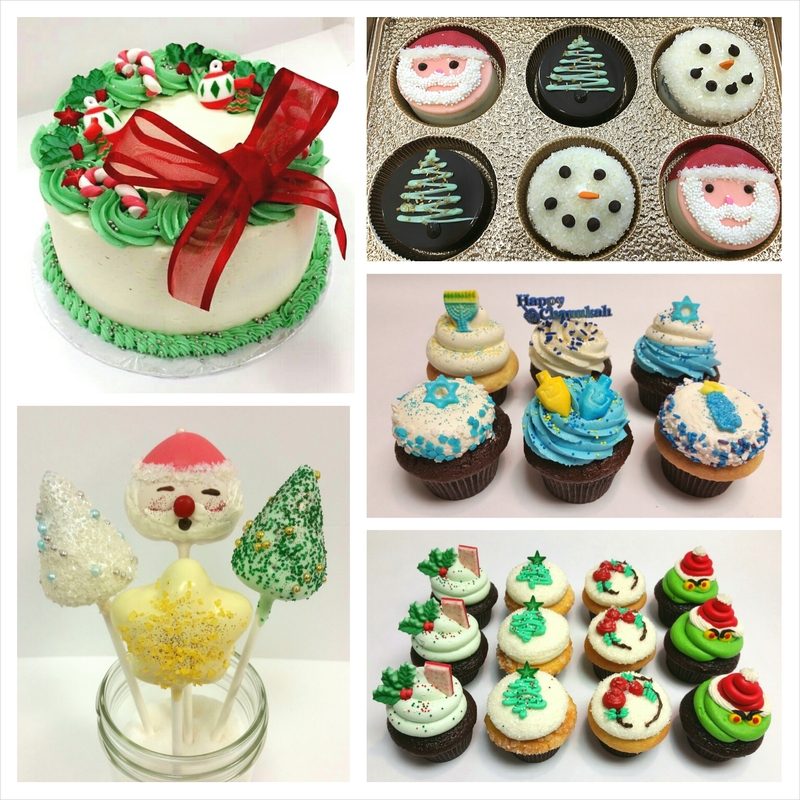 This holiday season, we aren't just making cupcakes, we are making some great cakes too! Spend your holiday being thankful, instead of baking, and choose from 4 crowd-pleasing dessert options! Feeds 8-12 people. Choose your cake and frosting flavors! 11.04.14 Become a Bakery Assistant! 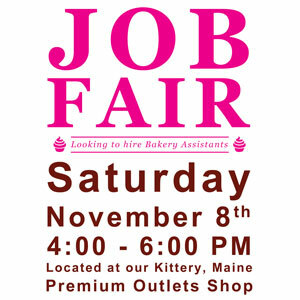 This Saturday, November 8th, attend our Kittery, Maine JOB FAIR from 4-6pm! We are looking to hire Bakery Assistants with flexible working schedules (days, nights & weekends) and all applicants must be 16 years or older. The Job Fair will be located at our new Kittery Maine shop in the Kittery Premium Outlets - the plaza with Nike! 11.01.14 Movember! Encouraging Men's Health! "Movember" has turned into an annual Men's Health Awareness month, as started by The Movember Foundation. Men all across the US grow their moustaches out throughout the month to support the cause. (YES that's why you're seeing so much facial scruff these days!) 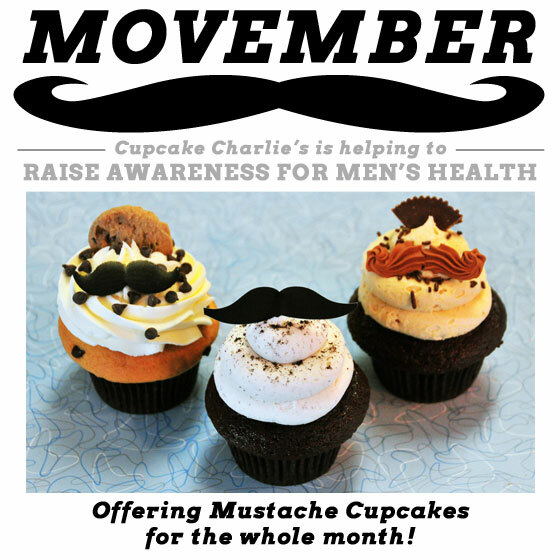 At Cupcake Charlie's we are hoping to help raise awareness of Men's Health with our Moustache Cupcakes! Every day throughout the month we will offer cupcakes with special moustache decorations on them. Buy some to support your favorite guy who may be participating in the month long trend! Available now through October 31st! We love halloween and it shows with our cupcakes! 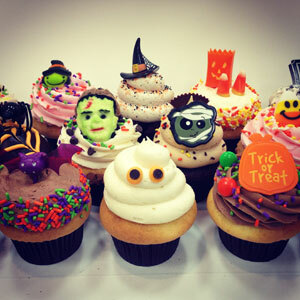 Come choose from a spooktacular assortment of decorated cupcakes now through Halloween! 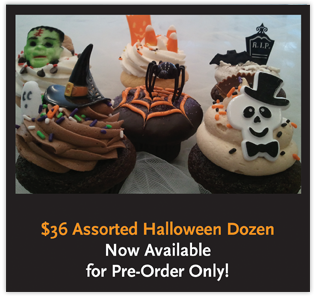 Order an assortment of your favorite flavors for your upcoming Halloween party too! 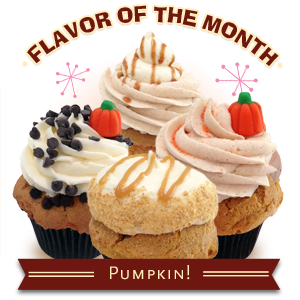 10.17.14 FLAVOR OF THE MONTH = PUMPKIN! 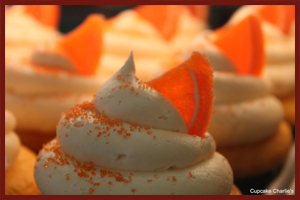 Throughout the months of October and November, we are baking up our special, seasonal Pumpkin Cupcakes! Customers wait all year for our homemade, pumpkin spiced cake and our 9 different pumpkin flavors. Every day at each of our locations we bake one of our different flavors! Enjoy flavors: Pumpkin Spice (made with Cinnamon and Cream Cheese buttercream frosting), Pumpkin Patch, Pumpkin Chocolate Chip, Pumpkin Pecan Crunch, Pumpkin Caramel Cheesecake, Pumpkin Pie, Pumpkin Walnut Streusel and Pumpkin Magic Donut Hole! 09.18.14 NEW FLAVOR: Apples Foster! On Saturday, September 20th, you can be one of the first to try our newest cupcake flavor: Apples Foster! 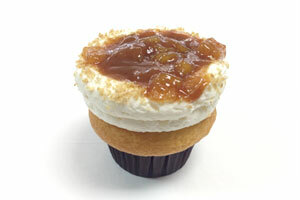 This is our fall spin on our very popular Bananas Foster cupcake! Made with an apple spice cake, topped with our classic vanilla buttercream frosting and filled with an apples foster filling! 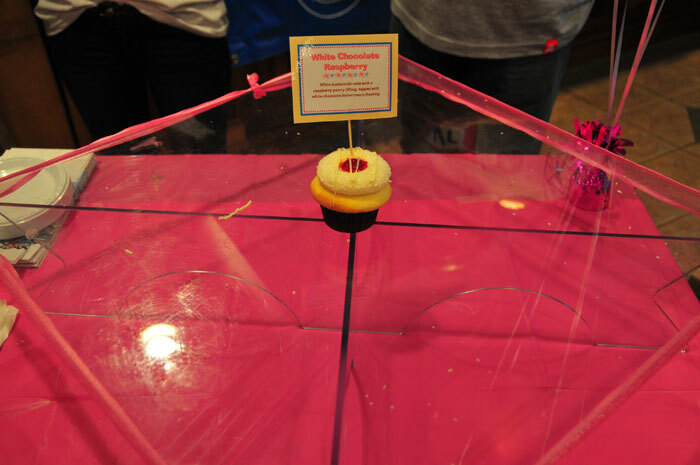 Join in the fun Saturday and gain bragging rights for being one of the first to try this brand new fan-favorite flavor! 09.01.14 Back to School hours are here! 05.23.14 NEW FLAVOR: Whoopie Pie Cupcake! 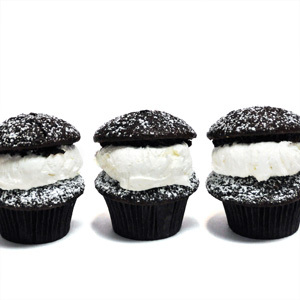 On Saturday, May 24th you can be one of the first to try our newest cupcake flavor: Whoopie Pie Cupcake! If you have never tried REAL Whoopie pie filling, then now is the time! This rich, chocolate, cupcake is made with a real old-fashioned, traditional, whoopie pie filling. It is then topped off with another chocolate cupcake top and finished with a sprinkle of powdered sugar! Join in the fun Saturday and gain bragging rights for being one of the first to try this brand new fan-favorite flavor! It is Memorial Day Weekend and it's the unofficial start to summer!! To help you enjoy the Summer season, our shops are now open later! Stop in after dinner for dessert and choose from our many freshly baked cupcakes, cupcake cookies, trifles, frosting shots, cake cups and cake pops! There is something for everyone! 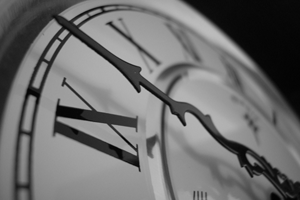 Check our Store Locations page for specific store hours. Soldier Suggestion?? If you know a soldier who would love to receive some cookies, please email us the shipping information to donations@cupcakecharlies.com. We will do our very best to ship the cookies to our customers' soldiers. Donations are being accepted both in-stores & online throughout April and May. For every $13 raised, 18 of our large Cupcake Cookies will be shipped! Every dollar helps. 04.07.14 An Easter Cupcake Assortment For You! Enjoy the best dessert on Easter, without all the work!! Now through April 19th our bakers are ready to take your Easter order! orders for our Easter Assortment! 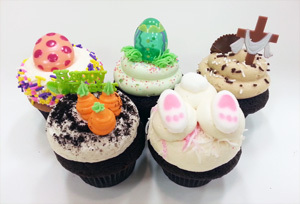 We have both Easter Bunny and religious Christian themed cupcakes for you to choose from. Order a solo box as a cute Easter present, get a small assortment for your family, or bring a dozen or more to your holiday gathering! 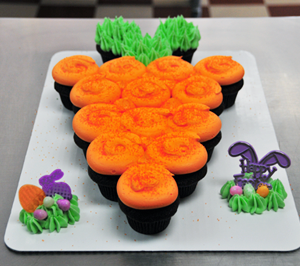 We also have our new "Cupcake-Cake" available in this cute carrot shape! 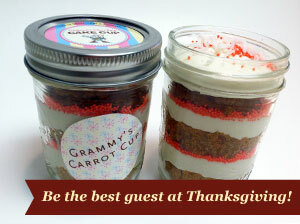 Available in flavors: Grammy's Carrot Cup, Chocolate luvs Vanilla or Vanilla luvs Vanilla. Call us to order yours! 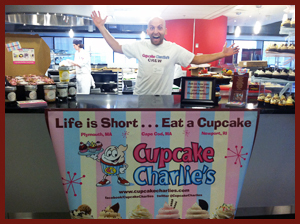 Call your local Cupcake Charlie's shop today! We will be CLOSED on Easter Sunday. Please pick-up your order on Saturday, April 19th. 03.20.14 NEW FLAVOR: Seven Layer Bar! 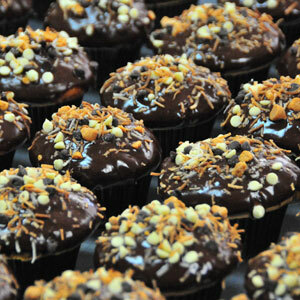 On Saturday, March 22nd you can be one of the first to try our newest cupcake flavor: Seven Layer Bar! This long awaited blend of delicious flavors will be available at all four stores. This vanilla cupcake is baked with chocolate, butterscotch, white chocolate and toasted coconut mixed in! We dip it in a butter ganache and sprinkle it with all of the same tastey morsels! Join in the fun Saturday and gain bragging rights for being one of the first to try this brand new fan-favorite flavor! This Valentine's Day we have many great options for you and your loved ones!! Whether you have been struck by Cupid's arrow or not, everyone LOVES a little sweet chocolate to celebrate Valentine's. 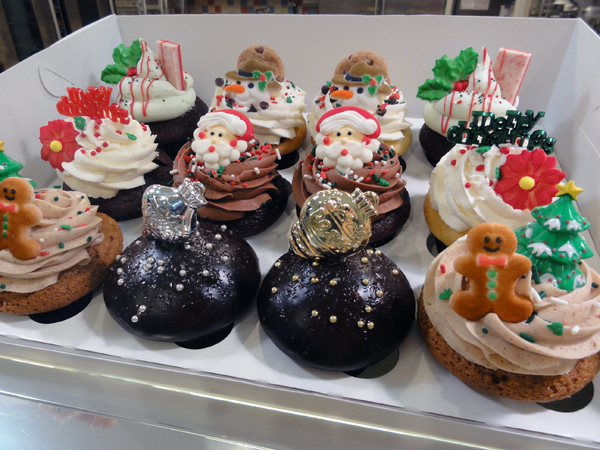 Our Cupcake Case has specially decorated cupcakes everyday leading up to the holiday. Our Cake Pops and Cupcake Cookies have Valentine's themes as well! Buy for your loved ones, your hunny, or show yourself some cupcake love! 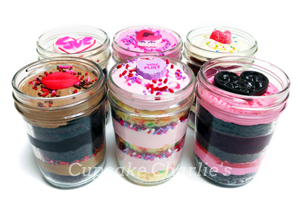 Our special Valentine's Cake Cup assortment is sure to spread the love! Order online for nationwide shipping by Monday February 10th 5pm EST for Valentine's Day arrival. 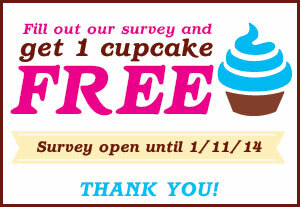 12.31.13 Get 1 FREE CUPCAKE coupon for completing our Survey! 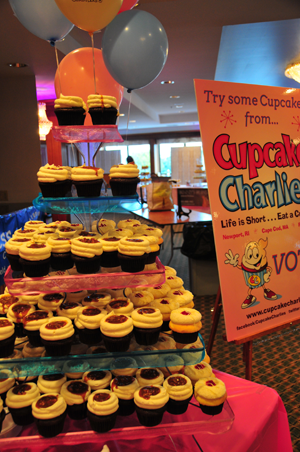 Please take a few moments to take our quick Cupcake Charlie's survey. We appreciate your honest opinions! 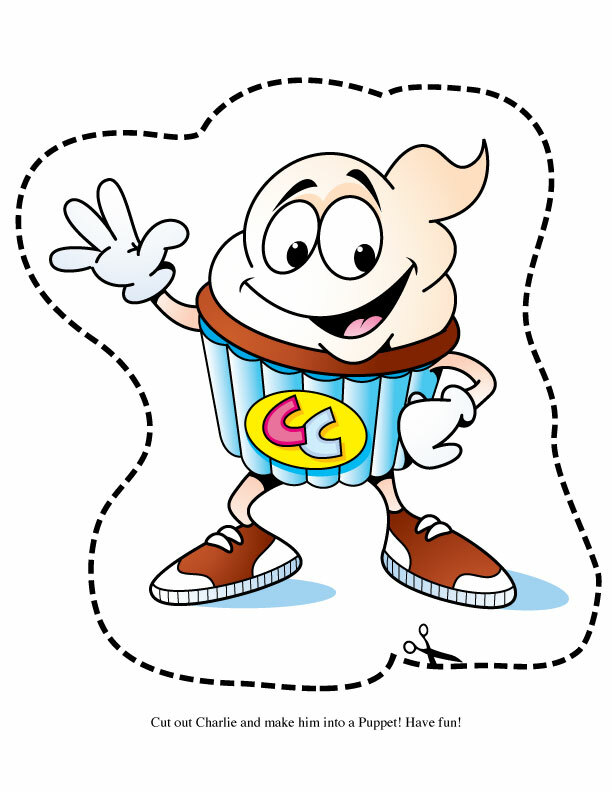 When the survey is completed you will receive a "1 FREE CUPCAKE" coupon which can be redeemed at any of our 4 locations. The survey will remain open until January 11, 2013. Your coupon will be valid for 1 time use until March 31, 2013. Thank You! Spend more time with family and friends this Christmas and less time in the kitchen! 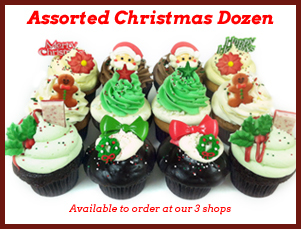 We have a special Christmas Assorted Dozen available to order! 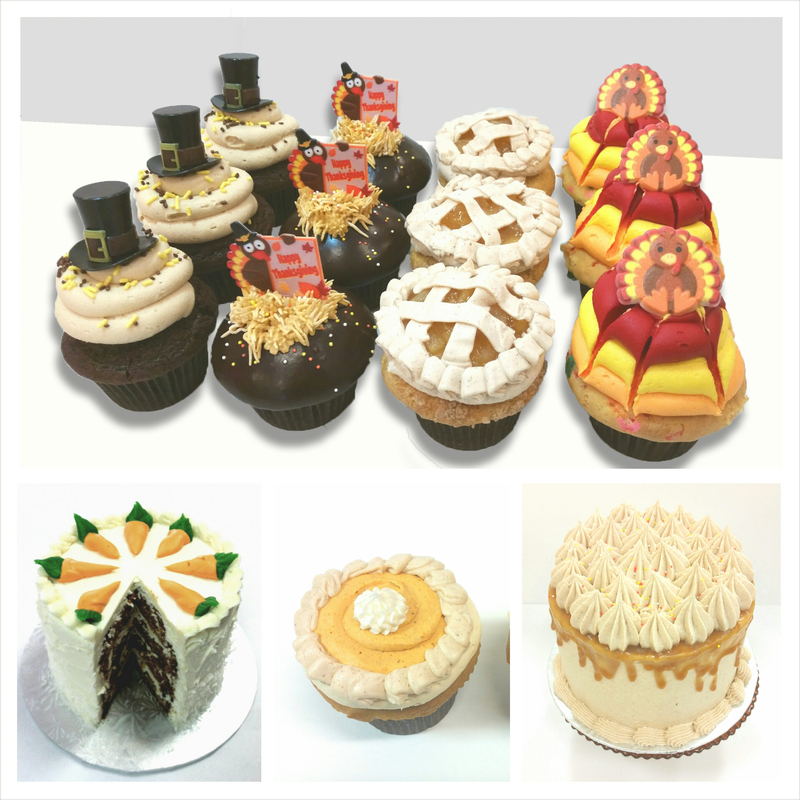 The dozen includes 4 of our best selling flavors, all decorated for the holidays! $36.00 / Dozen Flavors include: Christmas Funfetti, Chocolate Mint Madness, Vanilla luvs Vanilla and Chocolate luvs Vanilla! Your loved ones with LOVE these festive treats! 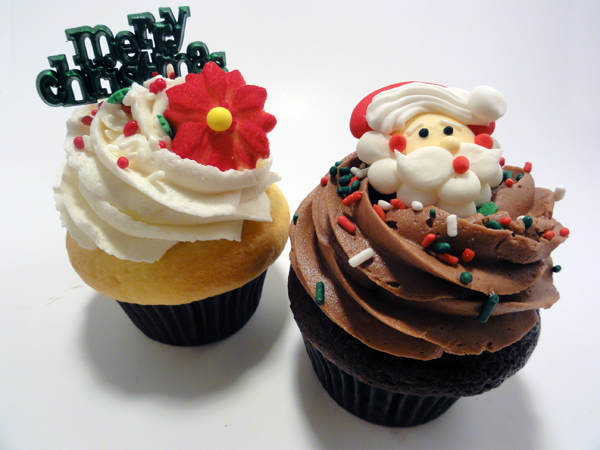 All of us at Cupcake Charlie's wish you a very Merry Christmas! We will be CLOSED Christmas Day and December 26th to spend time with our families! 11.23.13 Ship our treats in time for Thanksgiving! PLACE ORDERS BY SUNDAY 5PM EST! Do you live too far to enjoy our cupcakes on Thanksgiving?! Take advantage of our online ordering and nationwide shipping this week for the holiday! We are shipping on MONDAY this week so that you can receive your Cake Cups, Whoop Cakes, Push Pops or Cupcake Cookies in time for Thanksgiving. Our online order deadline this week is Sunday 5:00pm EST. Order online today! 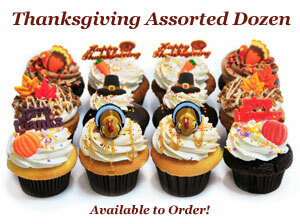 Our annual Thanksgiving Special Assorted Dozen is back!! 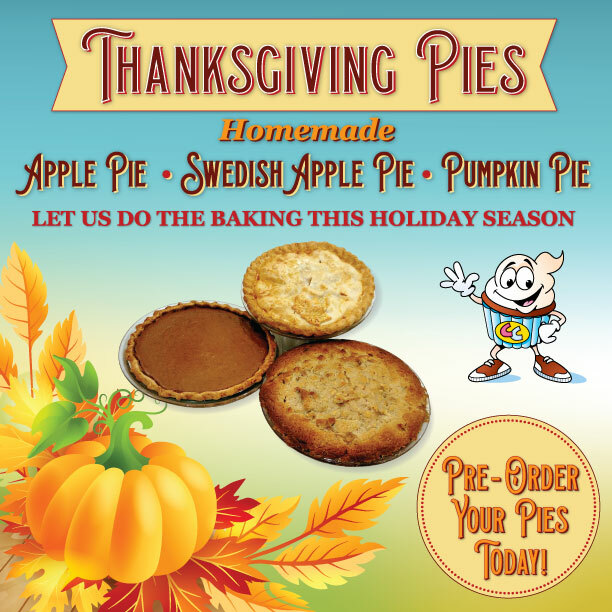 Order yours today at any of our four locations and pick it up this Wednesday, the day before Thanksgiving. Whether you are the host or the guest, these thanksgiving treats will be sure to add the finishing touches to the delicious meal! 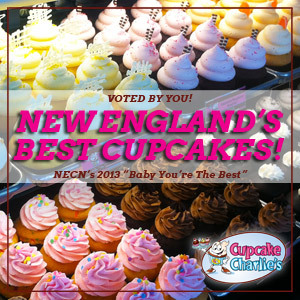 07.01.13 Voted NEW ENGLAND'S BEST CUPCAKES! We are so honored and excited to announce that we have been voted New England's Best Cupcake! Thank you to all of our customers, fans, friends and family who voted for us in Necn's 2013 Baby You're The Best summer contest! 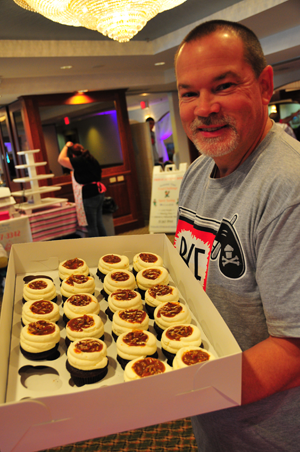 We owe a big thank you to our staff who help us bake our award-winning cupcakes everyday! View the award announcement here! 06.17.13 Summer LATE Hours Are Here!! SUMMER IS HERE! To help you enjoy the Summer season, our shop will be open LATE on Fridays & Saturdays - until 10:00 PM. Stop in after dinner for dessert and choose from our many freshly baked cupcakes, cupcake cookies, frosting shots, cake cups and cake pops! There is something for everyone! 05.03.13 Foxboro Shop Grand Opening Event at Patriot Place! Our Foxboro shop is ready to open it's doors! 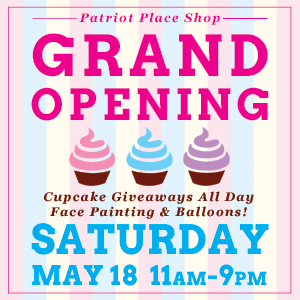 Come and join us on Saturday, May 18th from 11am-9pm for a day filled with Cupcake fun! Every hour on the hour we will be giving away a dozen cupcakes or more. There will be activities and fun for the whole family. Come by for a quick visit or stay the whole day! 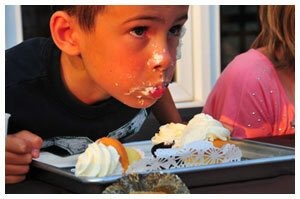 Either way, be sure to enjoy some of our delicious, freshly baked, award-winning cupcakes! Rain or shine. We are located in Patriot Place North Marketplace near Five Guys Burgers! We are now open Daily 11:00am - 6:00pm ! Stay tuned for extended summer hours coming in just a few short weeks! 04.19.13 Now hiring bakery assitants for Foxboro! 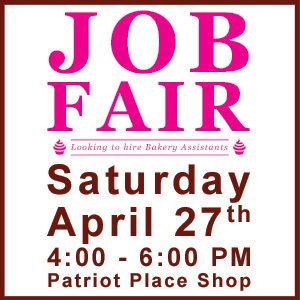 On Saturday, April 27th we are hosting a Job Fair at our new Foxboro Patriot Place shop! Come anytime between 4:00 and 6:00pm to meet with us and talk about your interest in working as a Cupcake Charlie's bakery assistant! 03.20.13 Easter Cupcakes & Cupcake Giveaways! 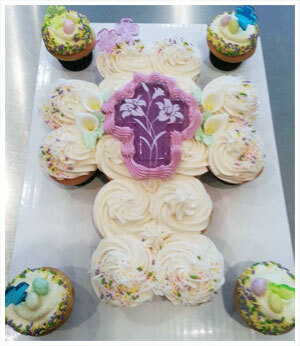 This special cross cake is available to order at our Mashpee shop for this Easter holiday. Available as an all vanilla, all chocolate or half and half, cupcake cake! Made with 18 Cupcakes and only $50.00! 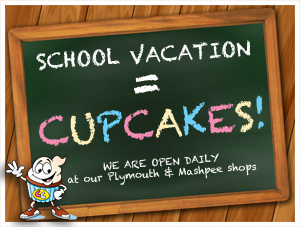 02.15.13 Enjoy CUPCAKES on your School Vacation! It is that great time again - SCHOOL VACATION is here! You have worked hard and earned this time off - reward yourself with a cupcake! Don't forget that we are open everyday and want to help you enjoy your vacation! So, sleep in, hang with friends, and come in for a cupcake or two! 02.01.13 Share your love with a Cupcake box of Chocolates! 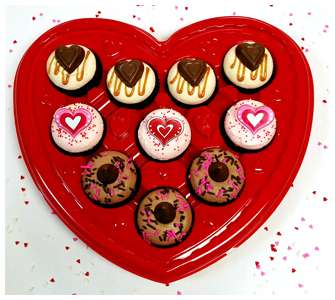 This Valentine's Day, give your sweetheart a Cupcake box of Chocolates! 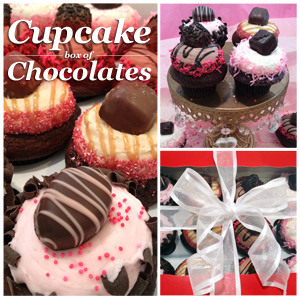 This assortment includes 4 different cupcakes inspired by the chocolates on top! Our bakers are happy to help you place an order in advance. Please call the shop to order yours! Pre-orders will be packaged up in a festive red box and wrapped in a ribbon! 01.14.13 COMING SOON to Foxboro's Patriot Place! 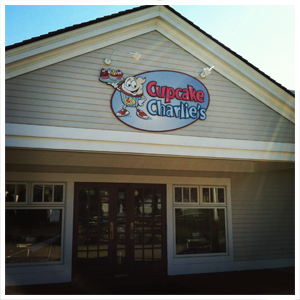 We are so excited to officially announce that we will be opening another Cupcake Charlie's in 2013! 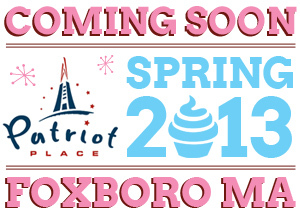 Foxboro's Patriot Place will be the home of our fourth location. Stay tuned for updates about the official Grand Opening! 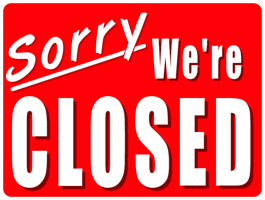 As of Monday, January 7th, our Mashpee shop is closed for maintenance. We will be closed through Monday, January 14th. We will re-open on Tuesday, January 15th - see you then! If you are in need of cupcakes during this time, please visit our Plymouth shop - open Friday, Saturday and Sunday from 11:00am - 6:00pm. Remember to show your Cape Cod ID to receive 10% off your purchase! 12.20.12 Christmas Cupcakes and Cookies! 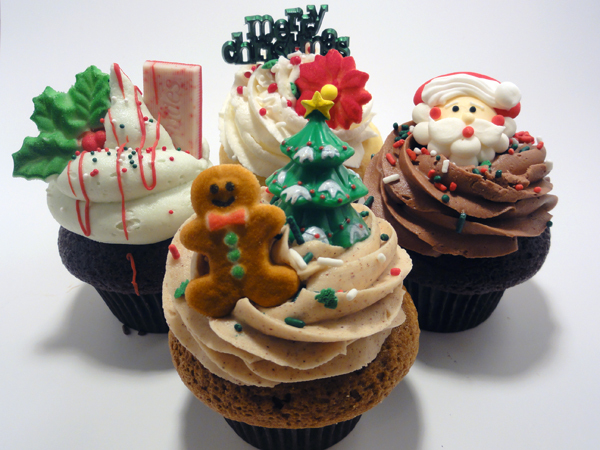 Like every holiday, this Christmas we have a great assorted dozen, adorned with festive cupcake toppers available to order! Call the shop or come in to order yours! 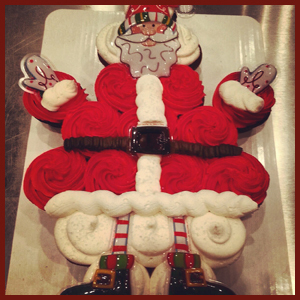 This Santa Cupcake display will definitely WOW your friends and family this year on Christmas! Made with 19 Cupcakes and only $48.00! Available to order at our Mashpee shop this holiday season. Santa Claus is coming to town - doesn't he deserve the BEST cookies around!? Our new Cupcake Cookies (made with our buttercream frosting and yummy cupcakes) are the perfect treat to leave out on Christmas Eve. Freshly baked, crunchy and chewy - these are our *newest* sweet treat and they are surely going to get you on the Nice List! Plan your order pickup ahead! We close at 4pm on Christmas Eve! Through December our Mashpee shop will be open special extended holiday shopping hours. Our Mashpee shop is located in the Mashpee Commons which is also extending it's hours to acommodate holiday shopping. Special extended hours are listed below. January Vacation: We will be CLOSED January 7th - 14th. Bring your Cape Cod ID during this time to our Plymouth shop (open Fri, Sat, & Sun all winter) to get a 10% discount on your cupcakes! 12.01.12 GINGERBREAD - Flavor Of The Month! December's Flavor of the Month is Gingerbread! Each day, in addition to our regular 14 flavors and a "flavor of the day", we will be baking one of our yummy Gingerbread Cupcakes! Enjoy flavors like Gingerbread Pecan Pie, Gingerbread Caramel Latte, Chocolate Gingerbread Snap and many more! Check our Facebook or Twitter pages daily to find out the flavor near you! 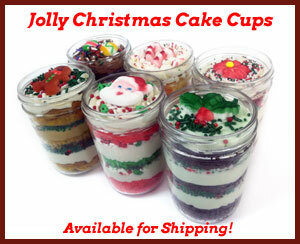 12.01.12 Jolly Christmas Cake Cups for Shipping! These sweet and festive treats are available for shipping Nationwide, now - December 16th! Our Jolly Christmas Cake Cups are the perfect gift for your friends and family afar this Christmas season. Each 8oz jar is layered with our Cake, Frosting and Filling and adorned with special edible decorations to spread the Christmas Cheer! We currently ship every Wednesday, but to ensure Christmas delivery we will be shipping Monday December 17th the week before Christmas. Available for shipping on: 12/5, 12/12 and 12/17! 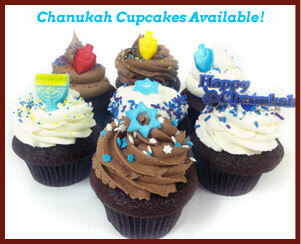 Stop in one of our shops or call and ask us about our Chanukah Cupcakes! We have a great variety of Chanukah Cupcake Toppers and are happy to decorate your favorite cupcakes to help you celebrate the holiday. Order today through December 16th. 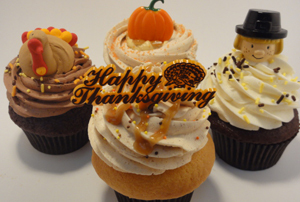 This year at Cupcake Charlie's we are thankful for family, friends and cupcakes of course! As a way of showing how THANKFUL we are for our customers, we have included some of the fall favorites in our Special Thanksgiving Dozen Assortment! Whether you are hosting or traveling to a loved one's for your Thanksgiving feast, let us help with the baking. 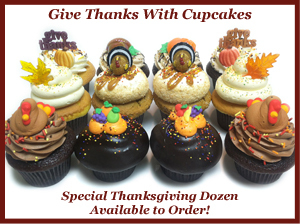 Order your Thanksgiving Cupcake Assortment today at any of our 3 shops and pickup on Wednesday, November 21st! *all shops will be closed on Thanksgiving day. 10.15.12 Halloween Cupcakes for your costume party! 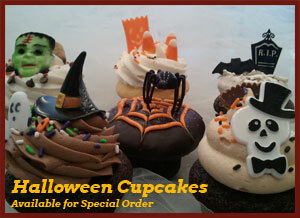 Call any of our three stores and place a special order for Halloween Cupcakes! 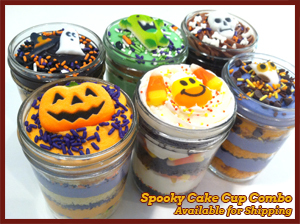 You choose the flavors and quantity and we will make them sPoOkTaCuLaR! Skip the Trick, just Treat your friends and family to these delicious goodies! Call today and order for your Halloween Party! 10.10.12 Shipping SPOOKY treats for Halloween! Also available for in-store pickup in Plymouth on 10/18 and 10/25 - order online as usual. 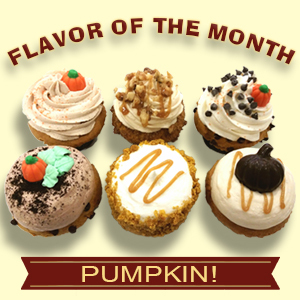 10.01.12 FLAVOR OF THE MONTH = Pumpkin! 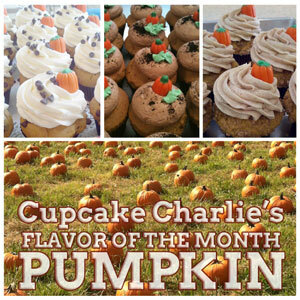 Through October and November all 3 shops are offering PUMPKIN flavor of the month! Each day, in addition to a regular "FOD", one of our Pumpkin Cupcakes will be available. 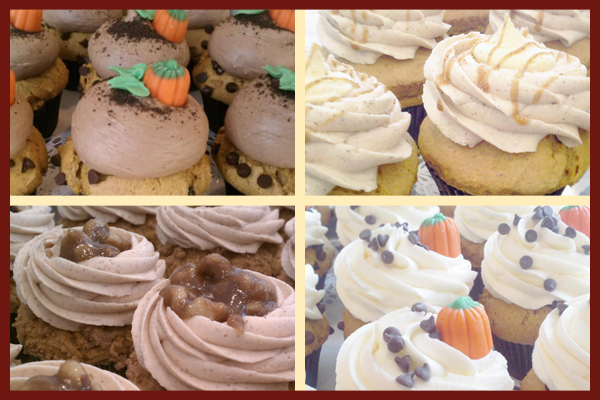 Enjoy some of the yummy fall favorites like Pumpkin Pie, Pumpkin Chocolate Chip, Pumpkin Walnut Streusel and more! 08.28.12 Jimmy Fund Family FUNdraiser - A HUGE Success! On Friday, August 17th we hosted a very successful and fun-filled family event to raise money for a great cause – The Jimmy Fund. The festivities took place from 4-8pm and we are proud to say it was our largest fundraising effort to date! The party attracted just under 1000 people and raised over $4200! The money was donated to the Jimmy Fund at the WEEI/NESN telethon on Tuesday, August 21st. 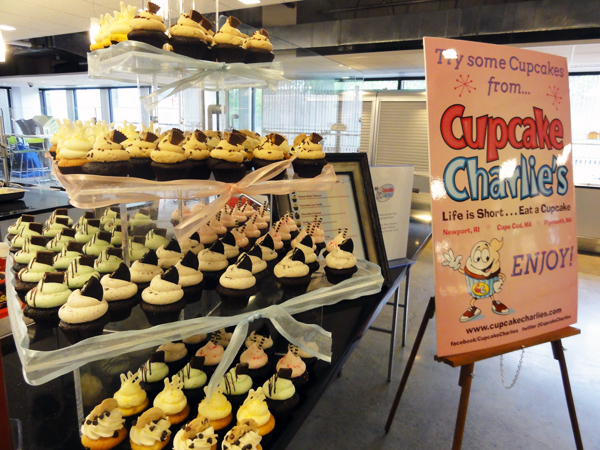 During the Jimmy Fund Family FUNdraiser event, we sold hundreds of cupcakes and every dollar earned was donated to the Jimmy Fund. A Cupcake Eating Contest lured in cupcake enthusiasts of all ages and every $10 entry donation was also donated to the Jimmy Fund. Live music, dancing, family games and cupcake related prize giveaways kept the crowd gathered outside our shop through the entire event. Opportunity ticket sales also helped add to the final donation tally. Attendees redeemed their tickets for Pizza donated by Papa Ginos, face painting, and opportunity prizes including a great variety of gift certificates, Johnny Cupcakes apparel, Boston Red Sox tickets, and even a Jim Rice autographed baseball! Over 15 local companies joined us in the fight against cancer by generously donating one-thousand dollars worth of prizes that were given away that evening! It is important to remember that every dollar counts. It was a really proud moment for us, handing that donation check over to the Jimmy Fund! Together we raised and donated $4,275! CLICK HERE To view ALL of the event photos on our Facebook Page! 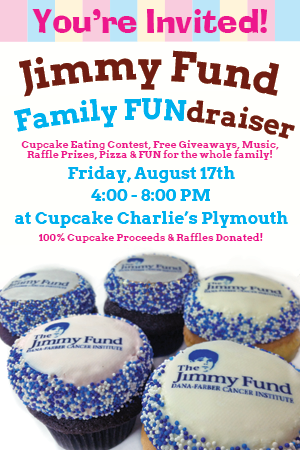 Cupcake Charlie’s Plymouth is hosting a fun-filled family event to raise money for a great cause – The Jimmy Fund. Join in the festivities and be a part of something special - their largest fundraising effort yet! The party will be held on Friday, August 17th from 4pm to 8pm. Free prizes (cupcake related of course) will be awarded every 15 minutes throughout the event. Raffle tickets will be on sale all day in an effort to raise money for The Jimmy Fund. In return, great prizes will be awarded including gift certificates, Kidville Playspace Passes, Johnny Cupcakes apparel, Boston Red Sox tickets, and even a baseball signed by a Red Sox legend! These are just a few of the great raffle prizes that will be offered during the event. Bring the whole family, and by making a small donation you can enjoy Cupcake Charlie temporary tattoos, festive face painting, live music and even a cupcake eating contest. Pizza from Papa Gino’s will be available and Fresh Baked Cupcakes will be on sale throughout the event with 100% of all the proceeds being donated to The Jimmy Fund. Can't make it? Donate Online! 07.10.12 Charlie's Summer Film Contest! It is that time again! Break out your camera and put Charlie to work... it is the 2nd Annual Charlie's Summer Film Contest! 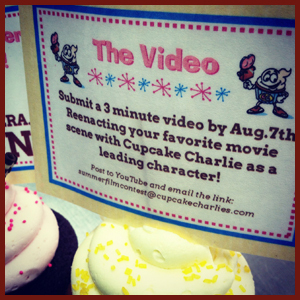 Submit a 3 minute video reenacting your favorite movie scene using Cupcake Charlie as a leading character! Use a stuffed Charlie mascot doll sold at any of our 3 shops, or print the Charlie puppet here or get creative! Submit by Saturday, August 11th! The Cupcake Charlie's staff will be judging the video entries based on: creativity of movie scene and best use of Charlie! 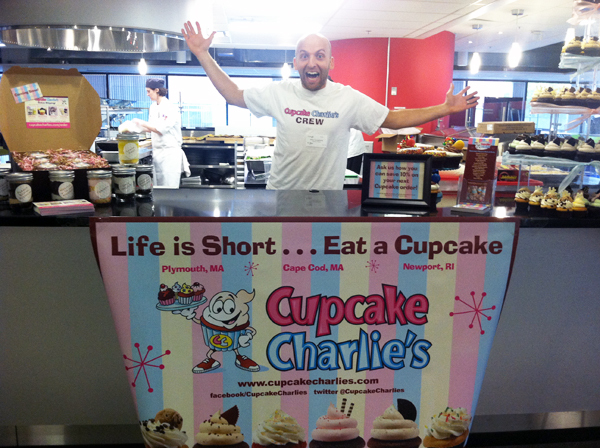 Grand Prize: $300 Cash, 1 dozen cupcakes, 1 free t-shirt and 1 Cupcake Charlie's Tumbler! 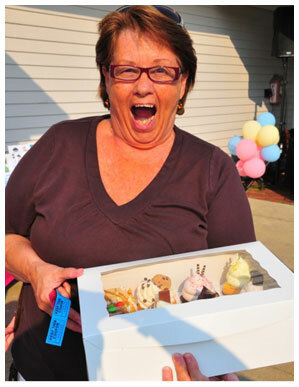 Second Prize: $200 Cash, 1 dozen cupcakes, 1 free t-shirt and 1 Cupcake Charlie's Tumbler! 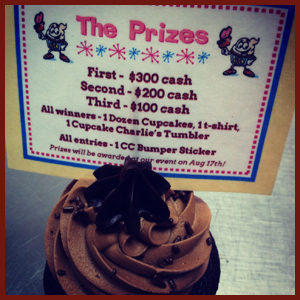 Third Prize: $100 Cash,1 dozen cupcakes, 1 free t-shirt and 1 Cupcake Charlie's Tumbler! All entries will recieve a CC Bumper Sticker! 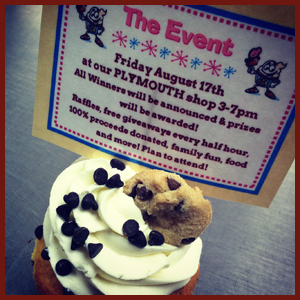 The three winners will be announced at our Plymouth shop on Friday, August 17th from 4:00pm - 8:00pm. Plan to attend a family, fun filled day of Cupcake eating contests, free giveaways every half hour, raffle prizes and 100% of the proceeds from will be donated to the Jimmy Fund! If you submit a video, plan to attend with friends and family to receive your prize! "Episode IV: A New Cupcake"
"The Princess and the Cupcake"
"Dance Party with Cupcake Charlie"
"Indiana Jones and the Holy Cupcake"
"We'll Always Have La Patisserie"
That is right! You can now enjoy the Cupcake Charlie's flavors you know and love at home! We are shipping our Cake Cups, Whoop Cakes, Push Pops and Cake Pops nationwide. Order combo packs such as Charlie's Crew Combo featuring all of the Cupcake Charlie's staff favorites or Fan Favorite Combo including all of our best selling flavors! 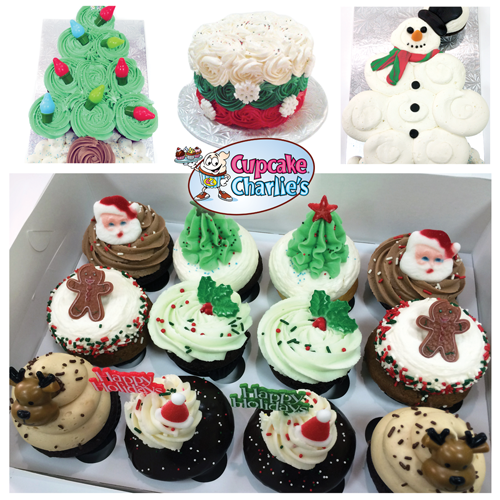 If you have a special request or need to order large quantities please feel free to email us at shipping@cupcakecharlies.com. Initially, shipping will occur once a week on Wednesdays. Please keep that in mind when ordering and expecting your treats! 06.17.12 Summer Hours are here! 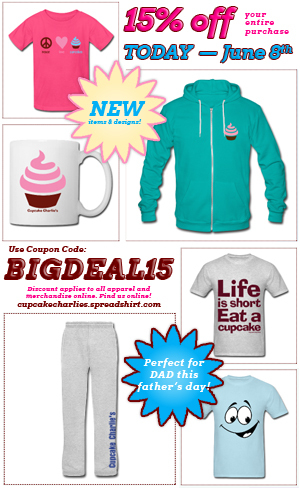 Today through June 8th use the coupon code: BIGDEAL15 to receive 15% off on our apparel website! New Merchandise like Mugs & Bags! Great Stuff for Dad for Father's Day! 05.28.12 Vote for our NEWPORT shop! Hey Fans! 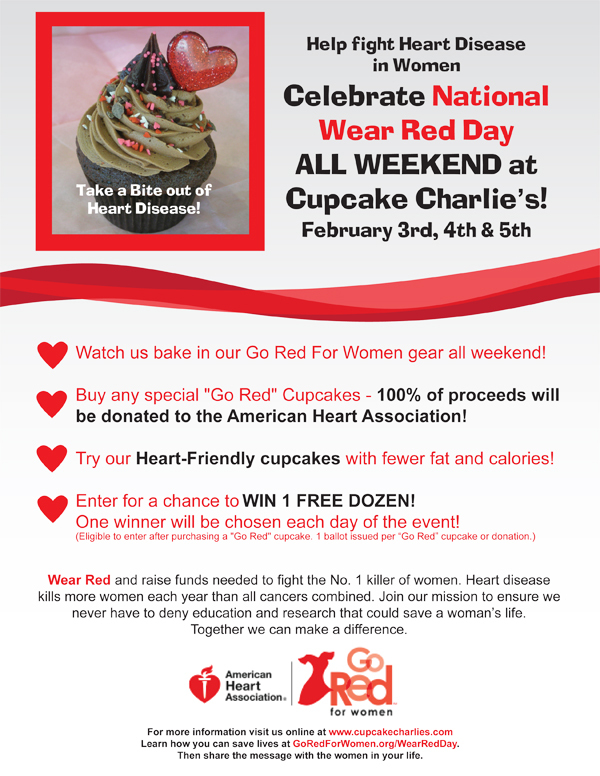 Time to show your Cupcake LOVE again! 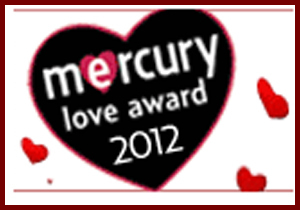 The Mercury Love Awards voting ballot is now open for voting! 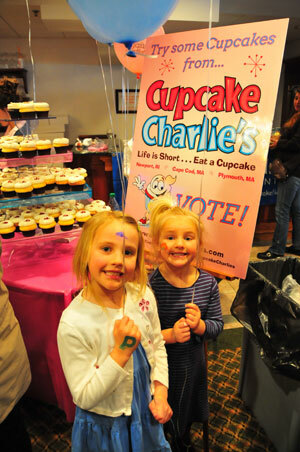 If you are familiar with the Newport, RI area, vote for all of your "favorites" and please don't forget to vote for Cupcake Charlie's on #9 - BEST CUPCAKE! THANK YOU! 05.28.12 Starting June 1st - Extended Weekend Hours! As of June 1st We will be open later on the weekends! Our weekday hours will remain the same, open Sunday - Thursday 11:00am - 6:00pm. See you soon! Mother's Day is Sunday, May 13th! Don't forget Mom this Mother's Day! Pick up an assortment of her favorite flavors or place an order for some of our special Mother's Day decorations! Call your local shop today. Decorations vary from shop to shop. We are open our normal business hours on Mother's Day! 05.01.12 Our Wedding Cupcakes on the Rhode Show! This morning our Newport shop was featured on The Rhode Show's "Wedding Week" talking about our Wedding Cupcakes! Penny Lessa, owner and baker, showed off our many cupcake styles, talked about our cupcake towers and introduced our new sweet wedding favors! Any of the decorations or designs can be done for special orders, just call any of our shops! 04.09.12 FRONT PAGE worthy cupcakes sold at Cupcake Charlie's! 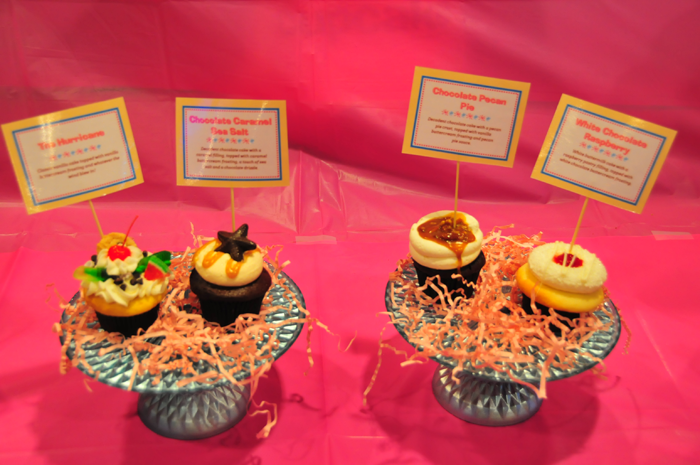 BRAVO to Sam Kendall, our Mashpee shop manager for the fine confections she whipped up for South Shore Living's Cupcake Battle! 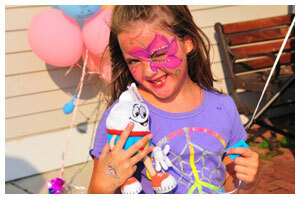 Her cleverly hand decorated designs are featured on South Shore Living Magazine's April issue found in stores now! 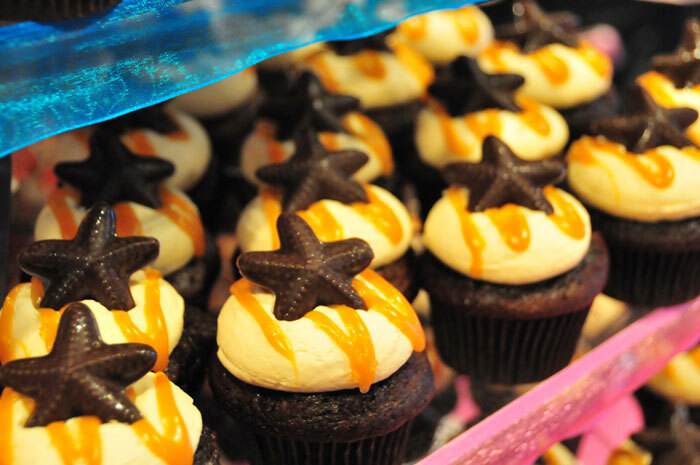 The flavor is our Chocolate Caramel Seasalt (Flavor of the Month at each shop throughout April) decorated with a homemade caramel-filled starfish, cake-pop beach ball and "sand" crumbles! Perfection! 04.03.12 Hop on in for EASTER cupcakes! 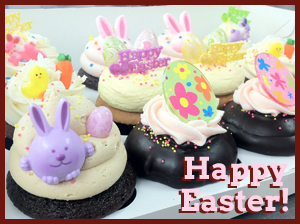 Let us help with the holiday baking - order your special assorted Easter dozen today from any of our 3 shops! We are open our regular business hours Saturday, April 7th. All 3 shops will be closed on Easter Sunday. 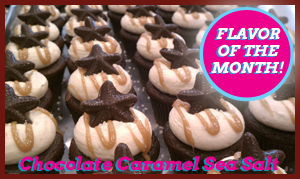 04.01.12 FLAVOR OF THE MONTH = Chocolate Caramel Sea Salt! 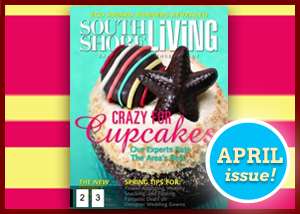 As seen on the cover of South Shore Living magazine for the month of April - Our Chocolate Caramel Sea Salt is Flavor of the Month! For all of April, each of our 3 shops will have this fan favorite, best-seller in the case everyday! 04.01.12 Orange Dreamsicle is BACK for Summer! Summer is just around the corner and that only means one thing... our refreshing orange zest cake is back in the cupcake case! Orange Dreamsicle is a summer favorite, filled with a cream filling and topped with a silky orange buttercream frosting - a perfect sweet treat on a hot summer's day! 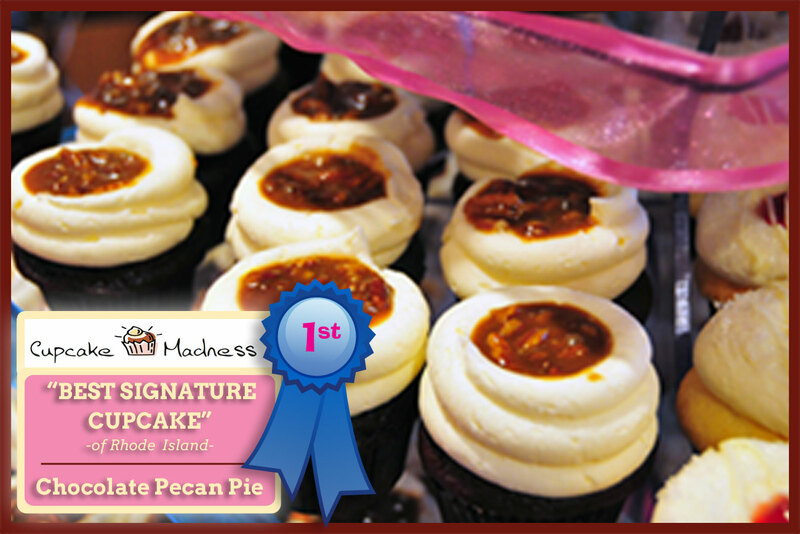 03.26.12 1st Place Winners for "Best Signature Cupcake" of RI! 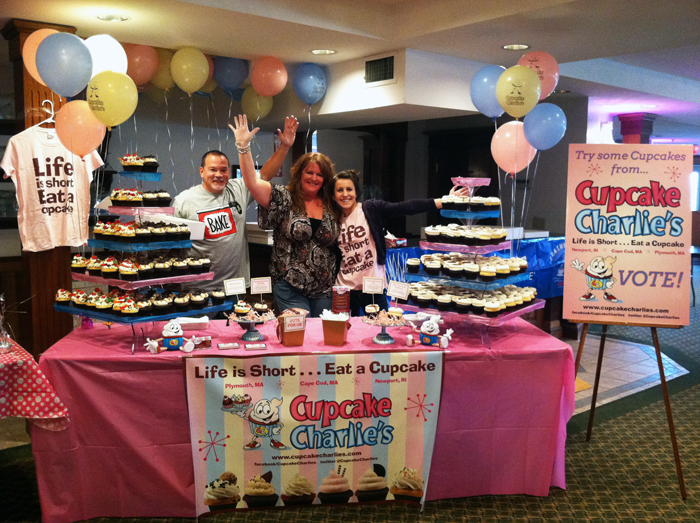 This past weekend, our Newport shop attended Cupcake Madness in Narragansett, RI! 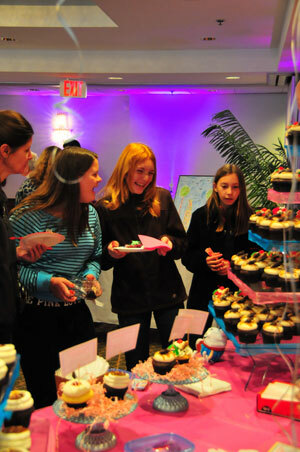 We were one of approximately 30 cupcake shops (and at home bakers) attending the event. 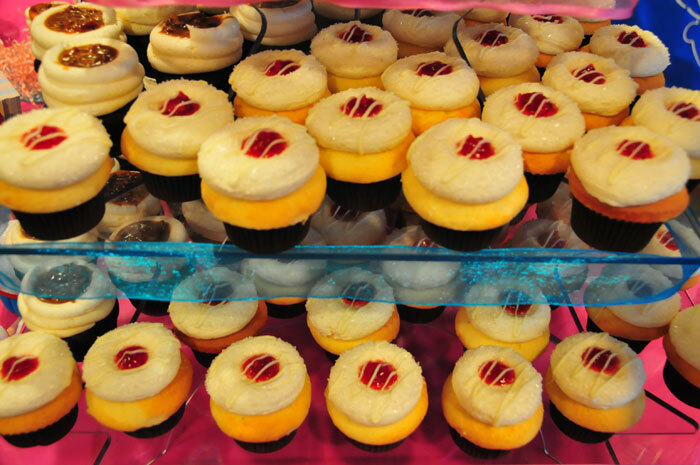 We brought some of our best selling Flavor of the Day cupcakes: Chocolate Caramel Seasalt, The Hurricane, White Chocolate Raspberry and Chocolate Pecan Pie! We are proud to announce that the Johnson and Wales professional judging panel voted our Chocolate Pecan Pie as the FIRST PLACE WINNER for "Best Signature Cupcake" of Rhode Island! Thank you to our many friends and fans who stopped by to show their support, the amazing folks at Friends of Hazzard Castle for putting on the event and congratulations to all of the other winners! 03.15.12 Happy St. Patrick's Day! 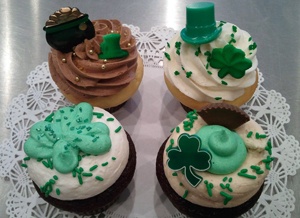 Enjoy St. Patrick's Day with some of our Irish-friendly cupcakes! 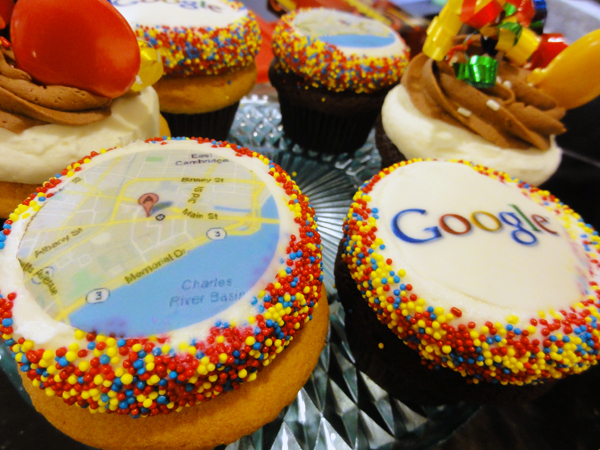 Our shops will have some of these special decorated cupcakes on March 16th and 17th. Call ahead to order yours! 02.12.12 Cupcakes for your LOVE! 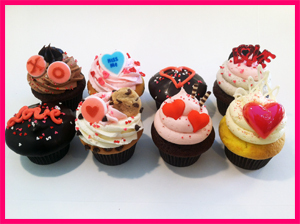 Nothing says true love like our cupcakes! Valentine's Day is Tuesday, February 14th - and what's a better post-dinner date dessert then Hostess With The Mostess or Chocolate Raspberry Surprise?! Order your assortment today for that special someone in your life. 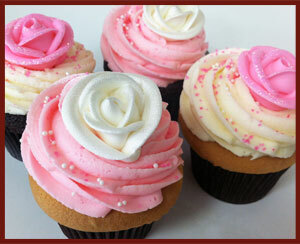 Come by our shop on Cupid's day and enjoy any cupcake with valentine's decorations! << Click the image to view more! 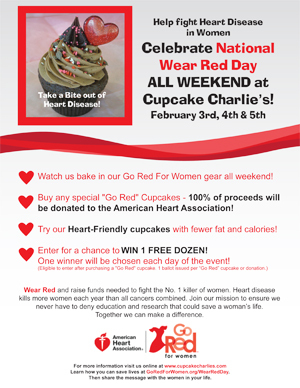 02.08.12 Take a bite out of heart disease! 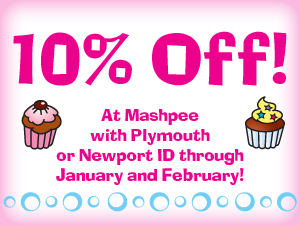 01.01.12 Show your Plymouth or Newport ID at Mashpee for 10% off! 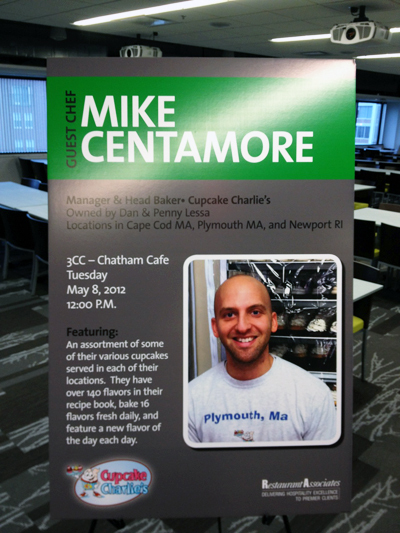 Through the months of January and February 2012 we will surely miss our cupcake regulars at our Plymouth and Newport shops while Charlie takes a little vacation!! 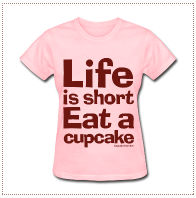 If you are experiencing a cupcake craving come visit us in MASHPEE!! Show your Plymouth or Newport ID to receive 10% off! As of Tuesday, January 10th Charlie is going on vacation!! We will be closed until Wednesday, January 18th! We Re-Open on Thursday, January 19th - see you then! Have a safe and happy winter! 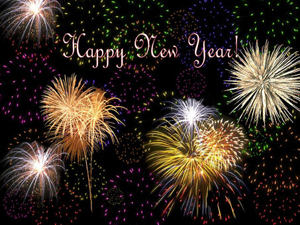 Cupcake Charlie's wishes you a very Happy New Year! We are open our normal business hours, 11:00 AM - 6:00 PM on New Years Eve, Saturday December 31st and New Years Day, Sunday January 1st! Come in and pick up your favorite sweets to ring in the new year the right way! 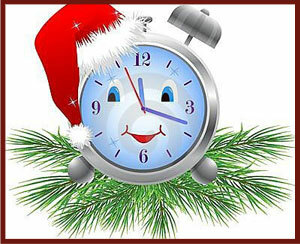 12.19.11 MASHPEE is open until 9PM Mon-Fri this week! This week, Monday - Friday, our Mashpee shop will be open until 9PM for the Mashpee Commons extended holiday shopping hours! 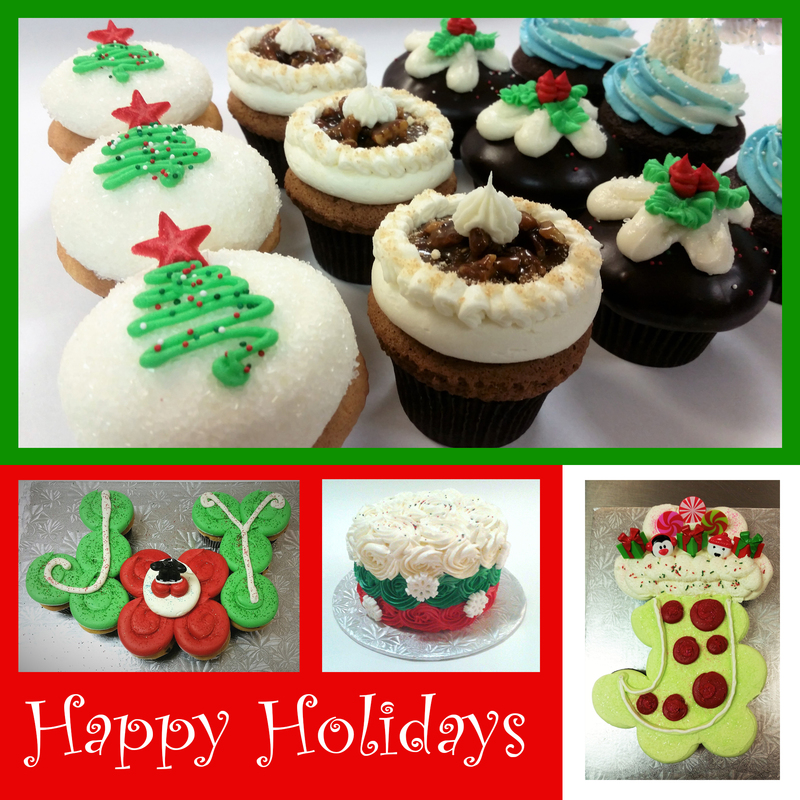 Take advantage of our late hours and stop by for your dessert or to pick up those Christmas cupcakes! 12.09.11 Order WHOOP CAKES for Shipping! 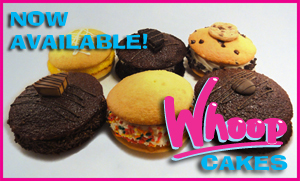 Finally our Whoop Cakes are available for shipmet! This holiday season we are taking orders for Whoop Cakes! Order today through December 16th midnight EST. All orders will be shipped on Tuesday, December 20th via USPS Priorty (2-3 Day) Mail. 12.06.11 Christmas Assortment Now Available! 12.02.11 WIN XMAS CASH! 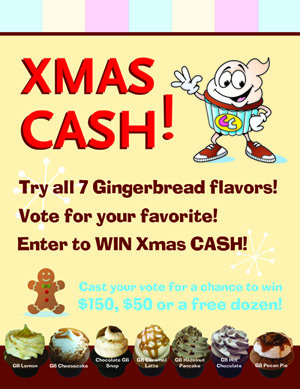 Try all 7 gingerbread flavors & vote for a chance to win! 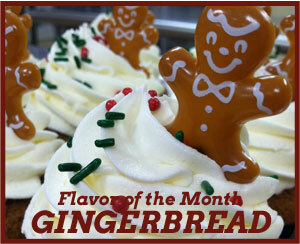 December is here, and our bakers have been perfecting their Gingerbread recipes for Flavor Of The Month! 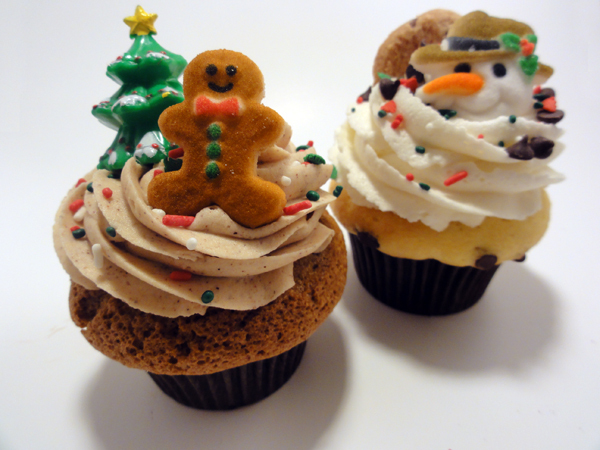 Between now and December 21st we want YOU to vote for your favorite gingerbread cupcake! By voting you could win some XMAS CASH! Win either $150, $50 or a free dozen! 3 winners will be chosen from each shop. 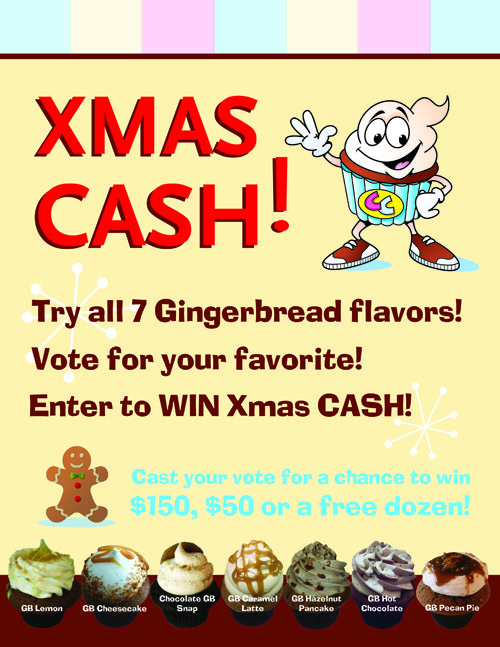 Each shop will bake the 7 different gingerbread flavors 3 times each so you get the chance to try them all (check your shop flavor schedule below)! All you have to do is come in, buy a gingerbread cupcake, take a gingerbread punch card and we will punch your card every time you buy a new gingerbread flavor! Get your card punched at any location. Fill up your card by trying all 7 and cast your vote for a chance to win XMAS CASH! Voting ends December 21st! Check your shop's flavor schedule so you can try all 7! 12.01.11 Our new online shop is up and running! 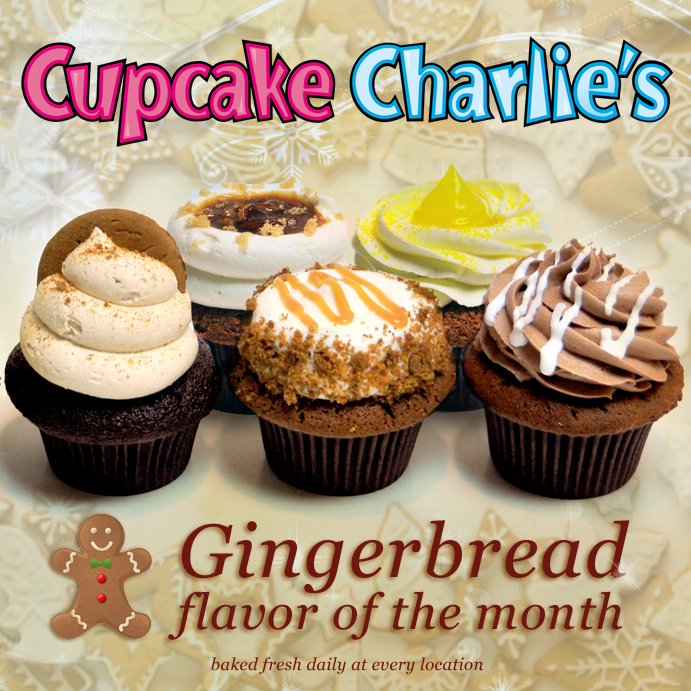 12.01.11 FLAVOR OF THE MONTH is Gingerbread! 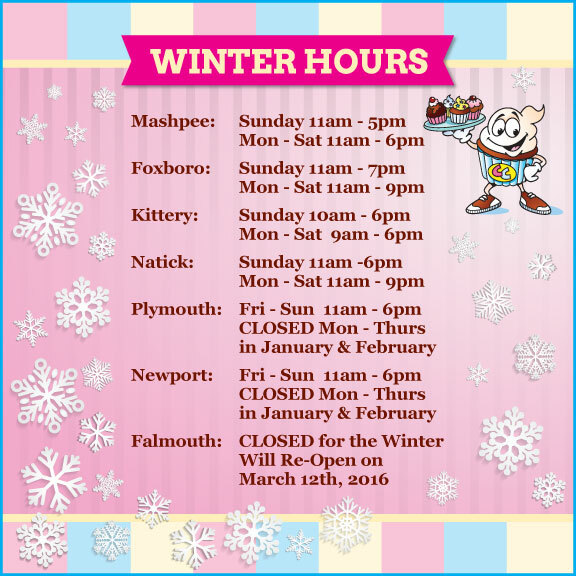 Starting on Sunday, December 4th, Mashpee will be closing at 5:00pm on Sundays. These shortened Sunday hours will last through the winter months. All of our stores will be closed on Thanksgiving. We will be open our normal business hours Wednesay 11am - 6pm. 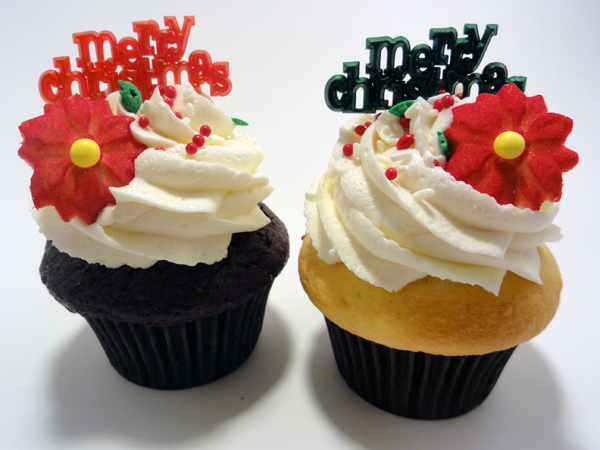 All of our daily cupcake flavors will be decorated for the holiday on Wednesday. 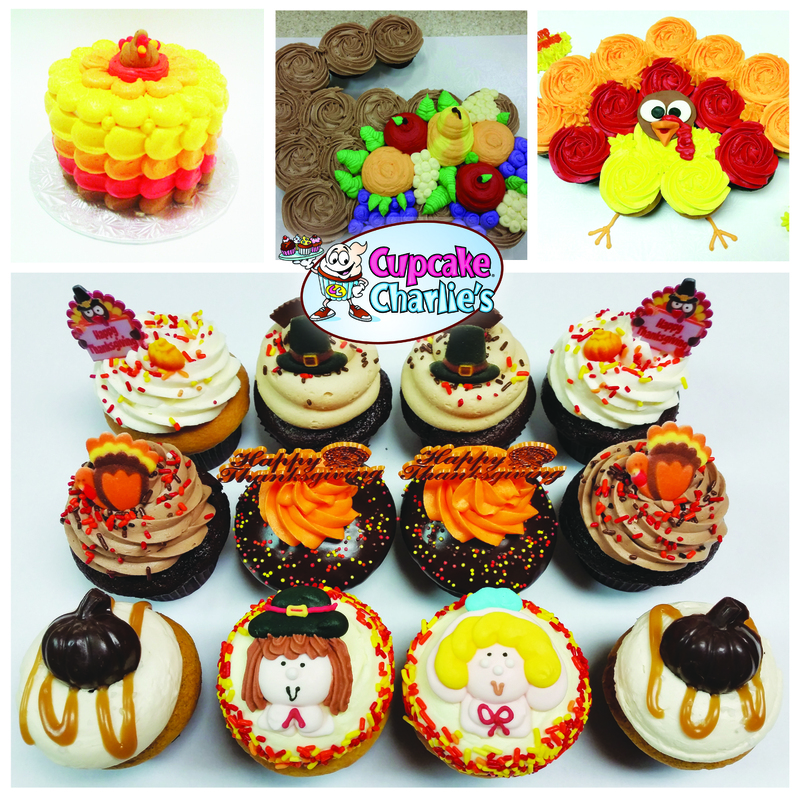 11.15.11 Thanksgiving Assortment Now Available! 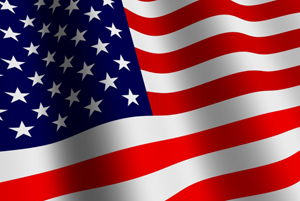 11.08.11 Receive 20% off on Veterans Day with your Military I.D.! In honor of our military heros we are celebrating Veterans Day by offering a discount to our brave military men and women. On Friday, 11.11.11 come in and show your official military I.D. and receive 20% off! Offer valid at all locations. 11.07.11 NOVEMBER: FLAVOR OF THE MONTH = Pumpkin! Starting Monday, October 31st, all 3 shops will begin our winter hours. Our winter hours are 11:00am - 6:00pm Daily. Come on by! 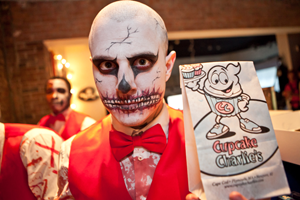 This past weekend, our friends at Johnny Cupcakes had their annual "There Is Something In The Cupcake Mix" Halloween t-shirt release! The tees are ultra-exclusive, numbered and sell out in less than one day. They asked us to make the spooktacular cupcakes for the event to supply some sweet treats to their die-hard fans (they were deserving after camping out for a week on the street)! 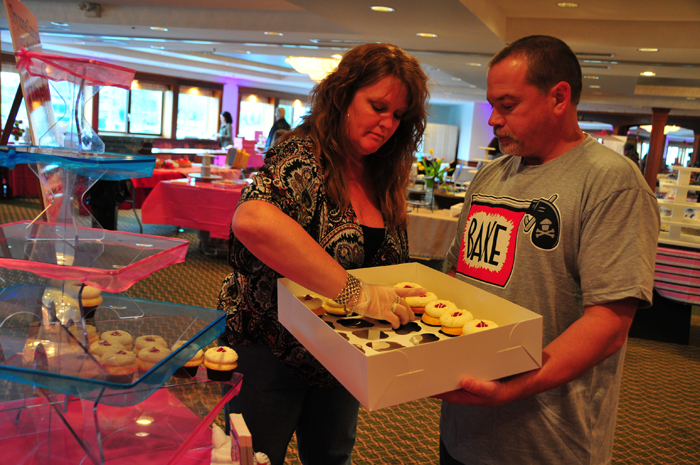 The event was their best yet and the first lucky 100 people who bought a tee got a cupcake for free! 10.07.11 Halloween Assortment Now Available! Our special halloween dozen assortment is now available for pre-order only! Call the shop or come by and order yours for that annual halloween party! 10.01.11 OCTOBER: FLAVOR OF THE MONTH = Pumpkin!